Do you enjoy traveling? 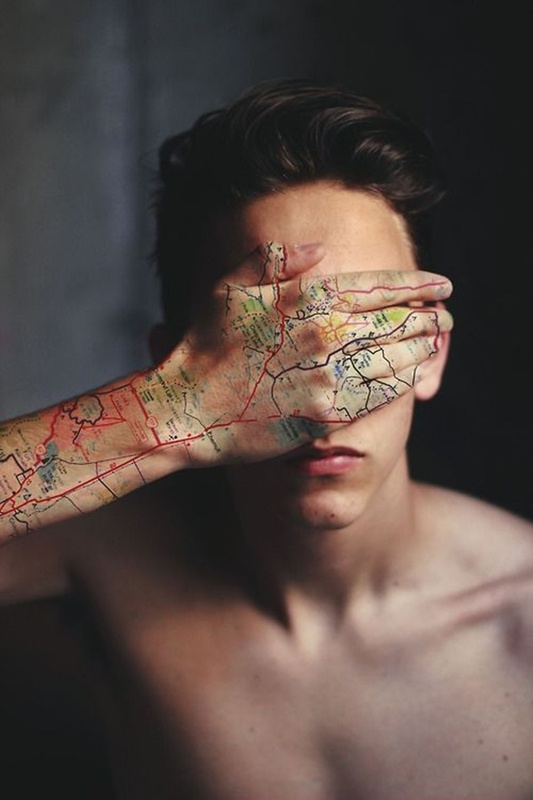 Do you have a cartography bent? 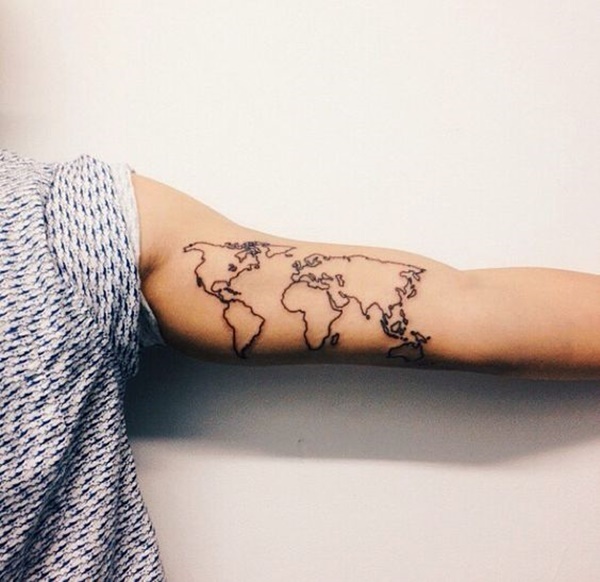 Look no further- this series of map related tattoos will give you plenty of ideas, from all over the world. 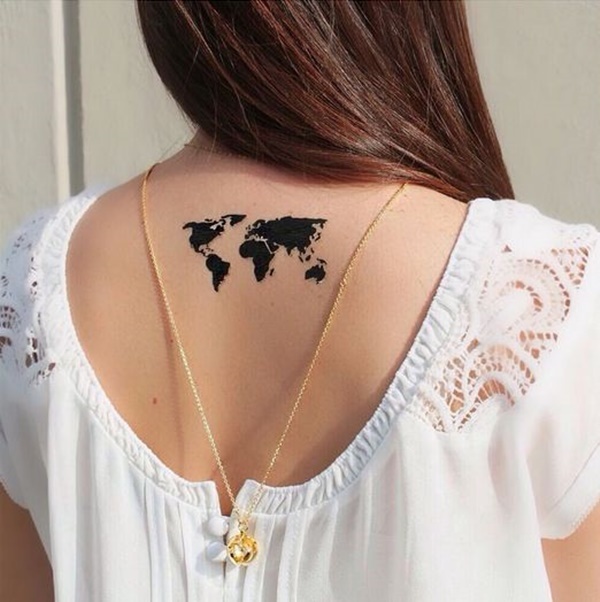 This crisp clear world map has clean black lines, and it works well against pale skin. 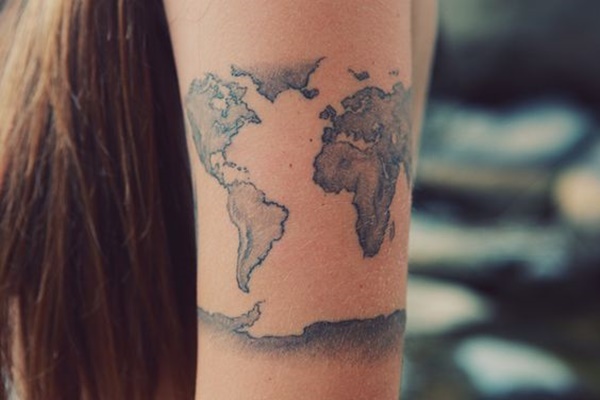 This style of tattoo is quite popular, and I would classify it: simple geographic rendition. 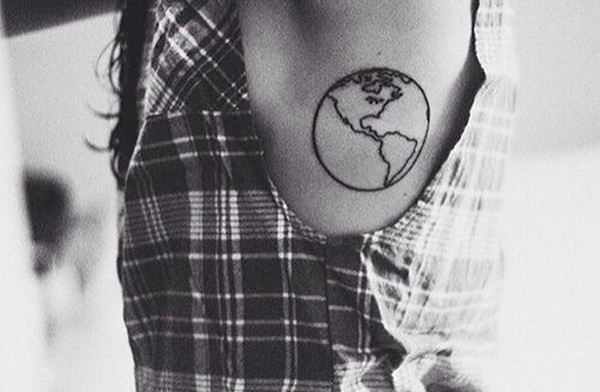 Similar to the tattoo above, this crisp outline frames the globe well. 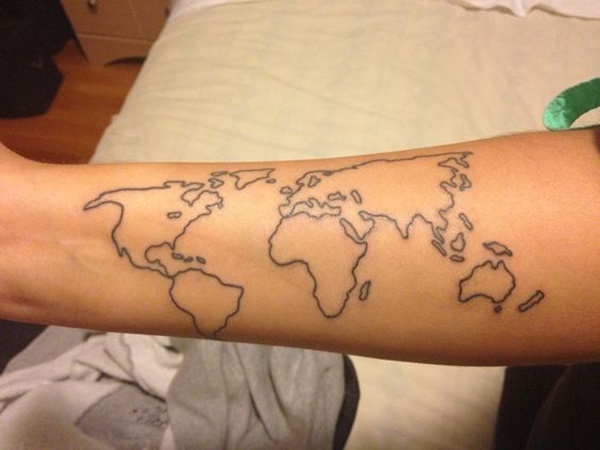 Situated on the forearm, this could make a handy reference. 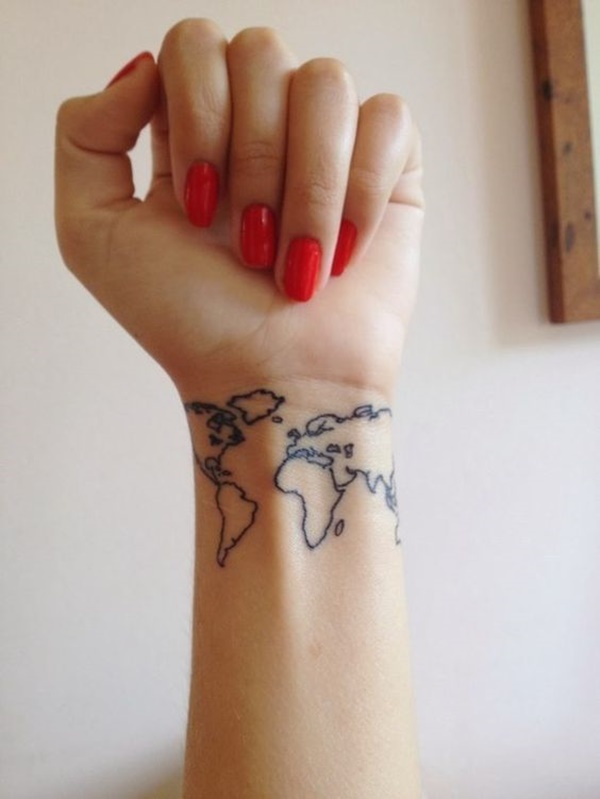 A tiny little rendition sits on the inside of the wrist, in a very light brown ink at that. 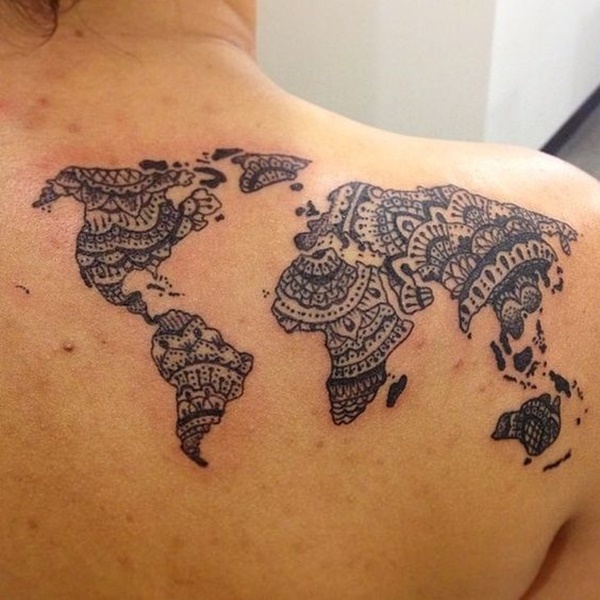 Very nice, but from anything further than a foot away it looks a little like a birthmark. Beautiful and well rendered, this map is filled with a series of mandala and paisley designs. 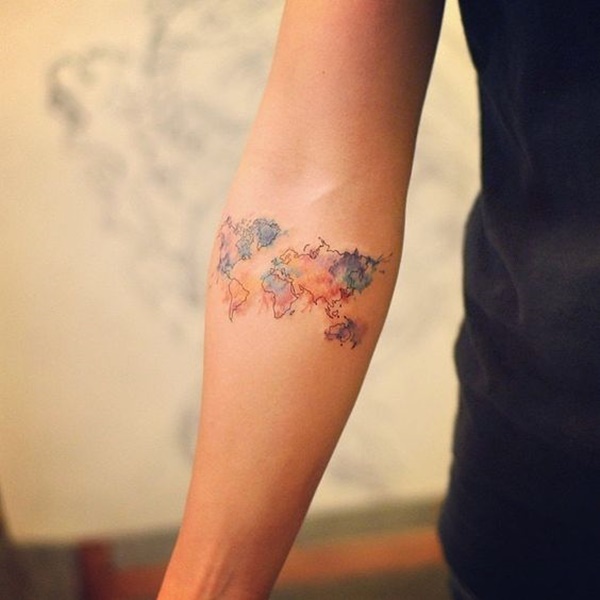 With shading and coloration reminiscent of a earlier era of tattooing, this is a lush and very high quality piece. 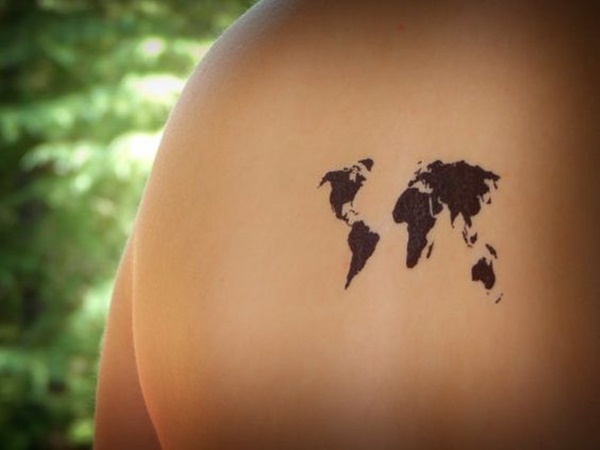 Simple geographic rendition sits between two shoulder blades. 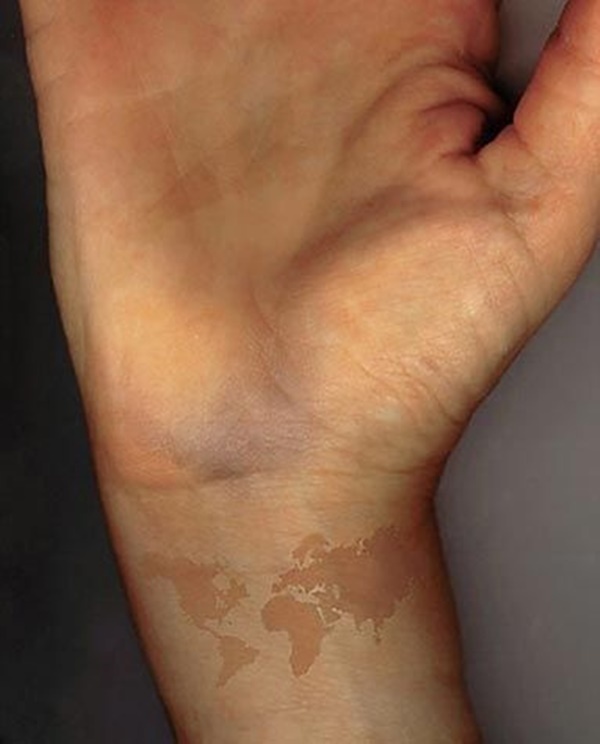 This faint outline sits on the same part of the wrist as the previous, with a similarly light shade of ink. 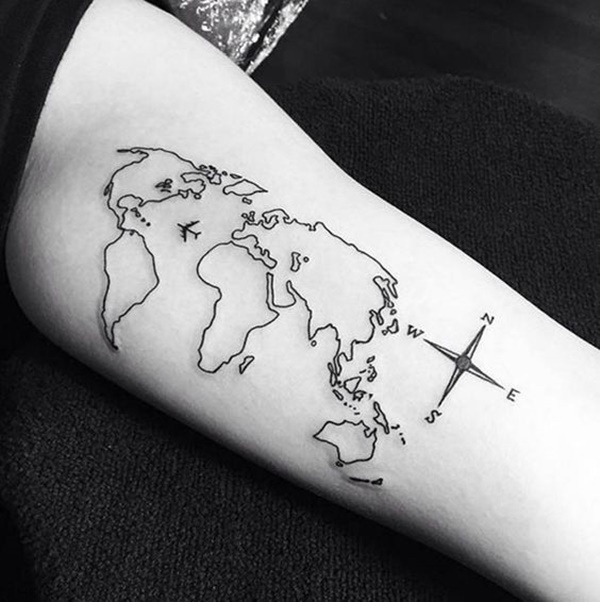 Getting small/lightly inked tattoos should be considered with care, because from further than a foot away, this resembles a scar. Simple geographic rendition appears again on the right flank of this individual. A difficult spot for the ticklish. This watercolor-esque version is quite charming. With soft edges it comes across nicely, although the stylized compass is not quite pointing north. I’m assuming this is from a Klamath Falls, Oregon native. 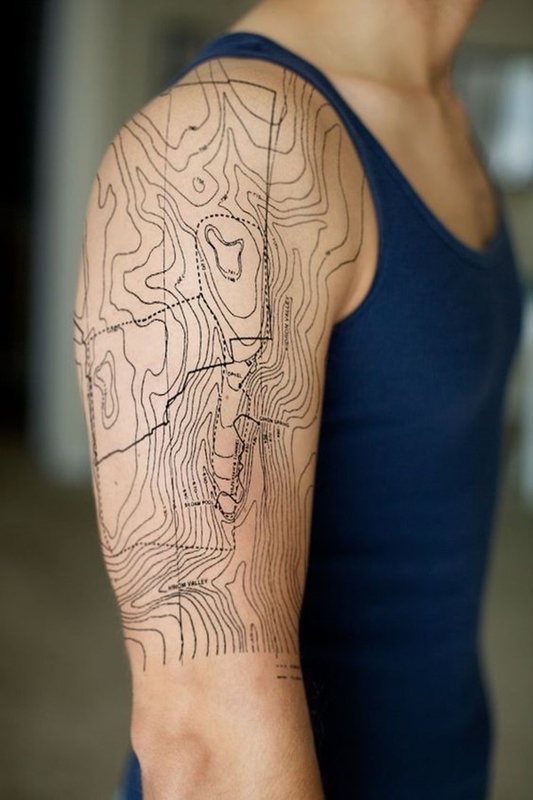 It takes a strong sense of attachment to a place to have a road map of the city tattooed- although, considering the popularity of bicycling in Oregon, an enterprising bike messenger could kill two birds with one stone by representing his or her city as well as always having a handy reference map at hand. 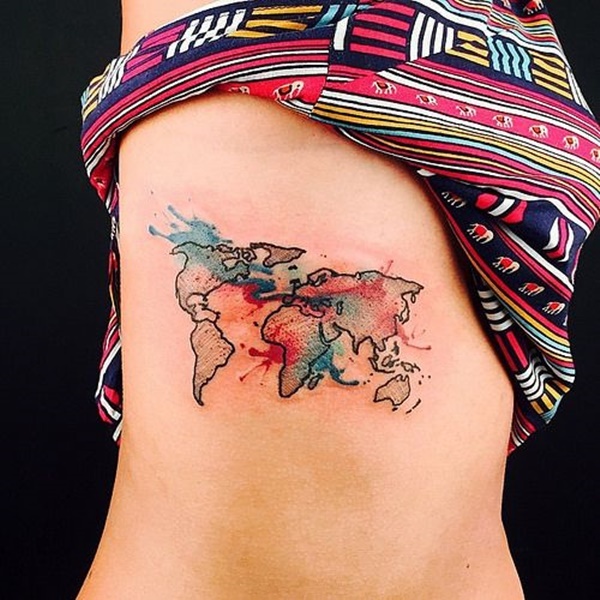 A splash of red and blue punctuate this spotted map. A throwback to the older era of map making, this stylized version has soft black and white fading, and some cute little waves. This stark and simple design is executed extremely well. 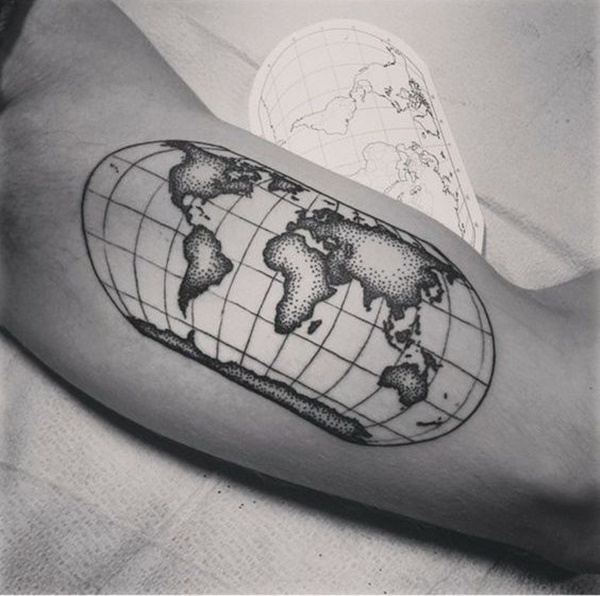 The positioning and orientation of the lines gives this piece a sense of depth that is clear from the start- the continents appear to float on this ghostly globe. It takes a smooth steady hand to produce these clean lines. This topographical map is an interesting choice because it has an interesting juxtaposition- it has both artificial and organic qualities. 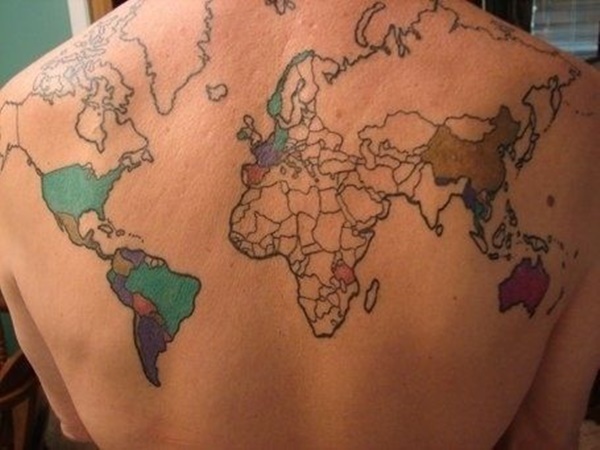 This is an interesting tattoo, if for visual reasons alone. 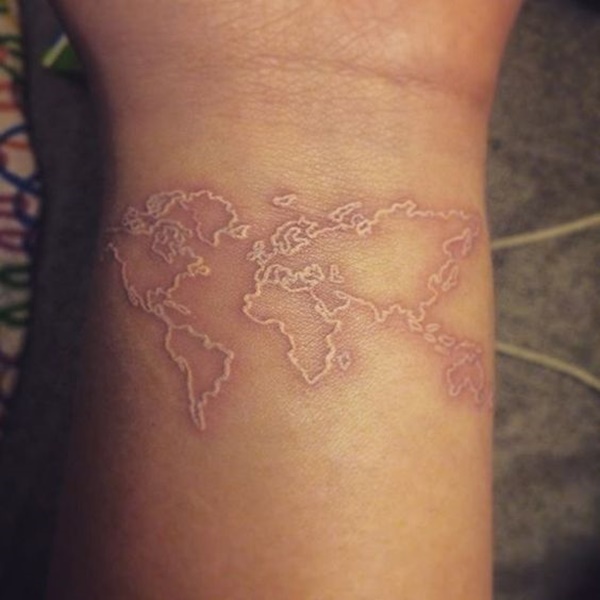 Simple geographic rendition returns on the wrist. This cut in half globe is straightforward and well done. 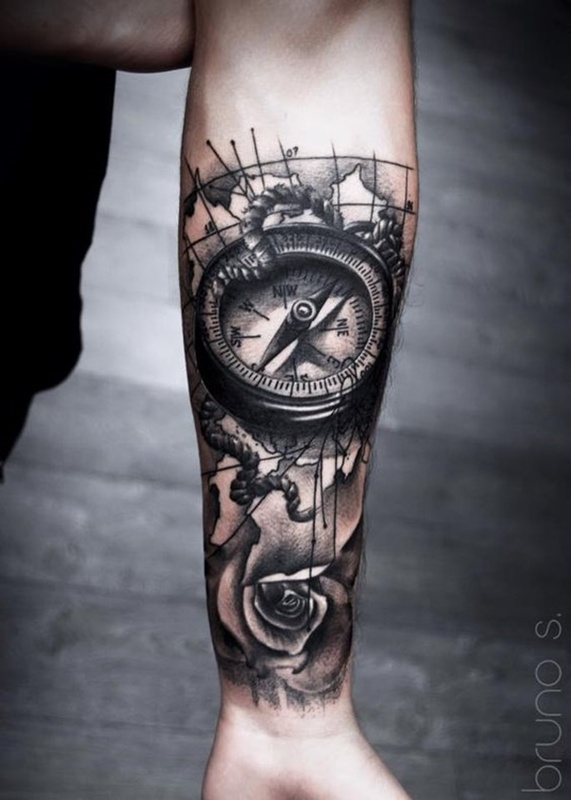 The compass is the centerpiece of this forearm tattoo. 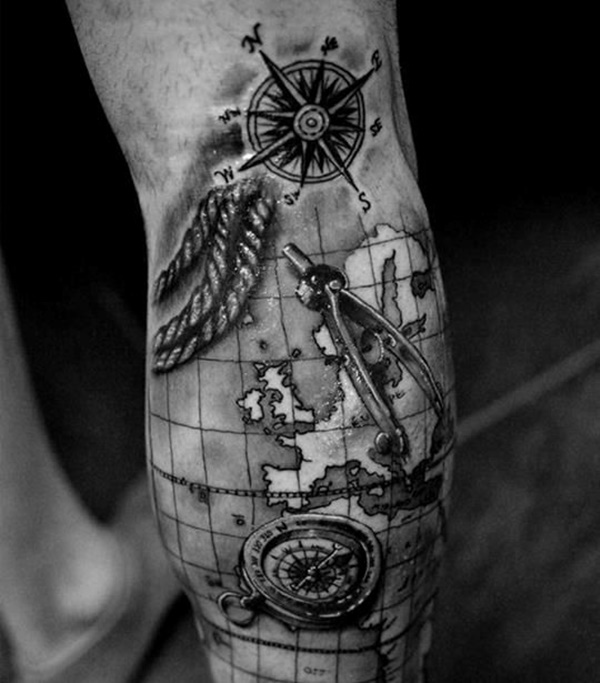 In the black and white style of old maps, this evokes the designs favored by old-world sailors. 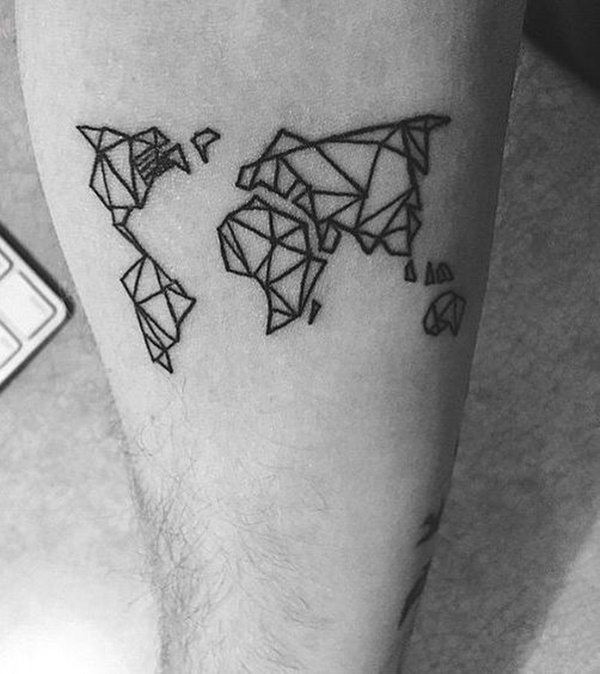 Simple geographic rendition returns, this time a little further up on the forearm. 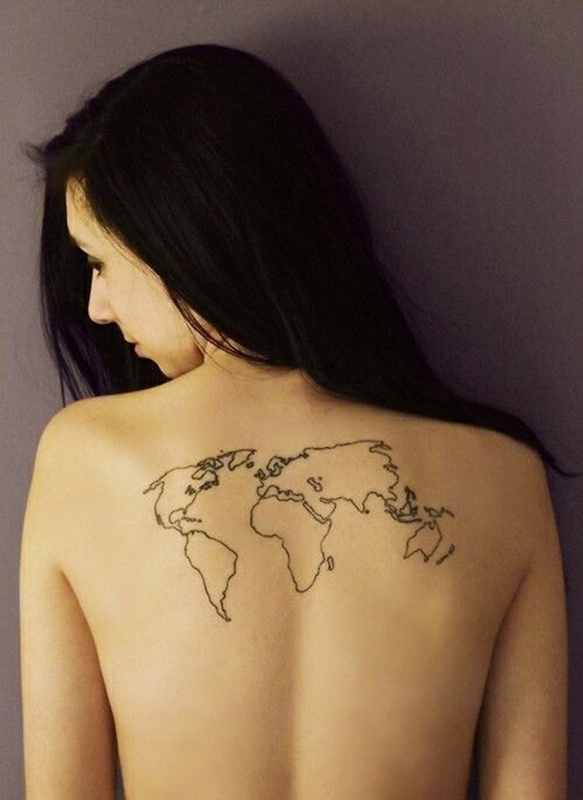 This version of simple geographic rendition actually has the continents reversed from how they are normally displayed, with the Americas on the left and Eurasia on the right. 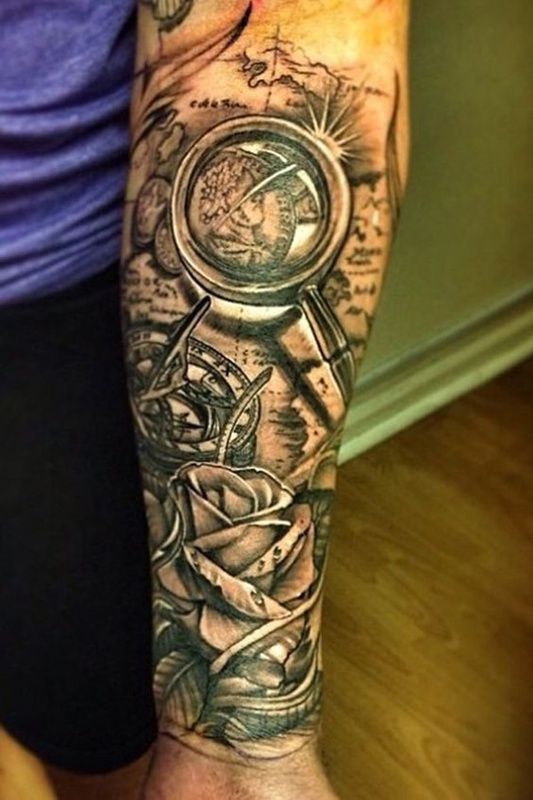 This dark tattoo features several icons, the rose, the map, the rope, the compass- evoking ideas of romance and escape. 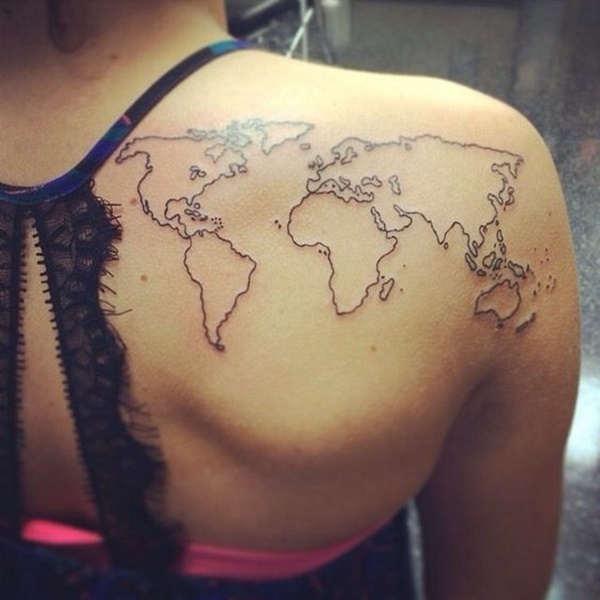 Simple geographic rendition makes an appearance on the nape. 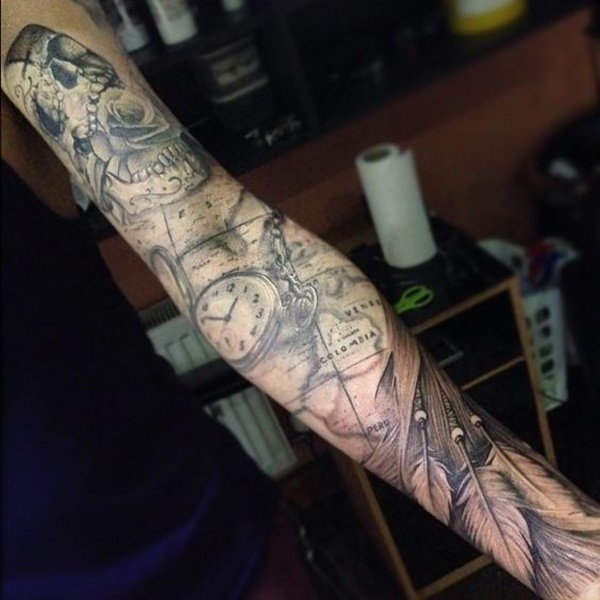 This tattoo is an amazing work if for its’ texture alone. Bearing the texture of faded and crumbling paper or plaster, the subtle fading really illuminates the difference in layers. 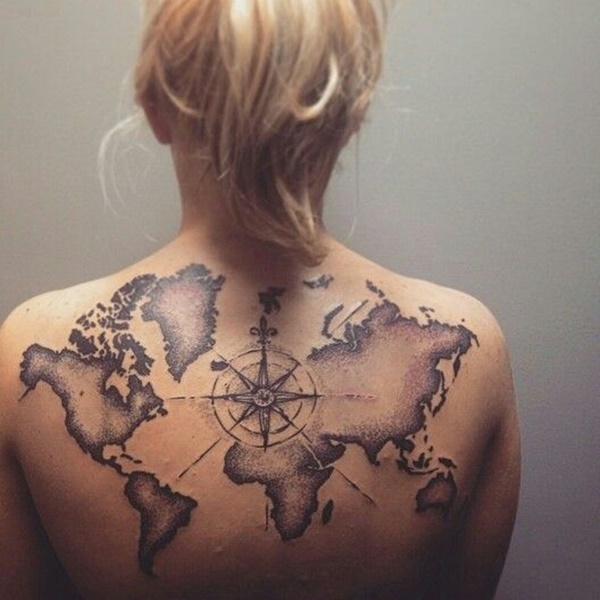 A compass gives way to a unidentified map, but to where? Dino Island. The Land Down Under. Straya’ m8. 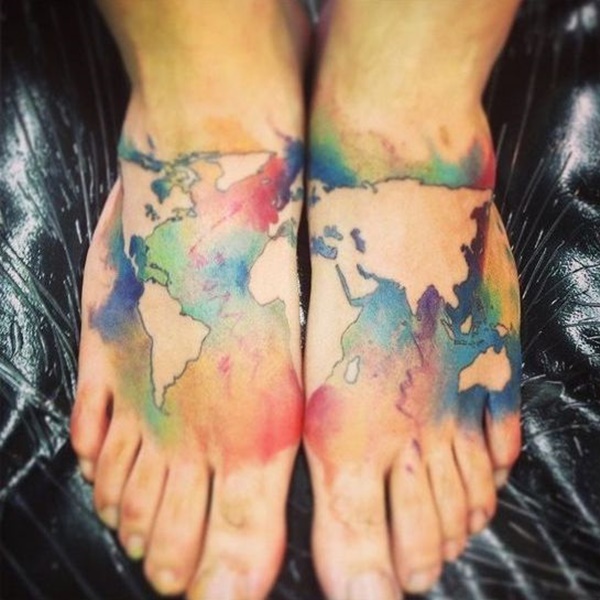 The sea adopts a pretty rainbow of color, making these continents stand out on these feet. 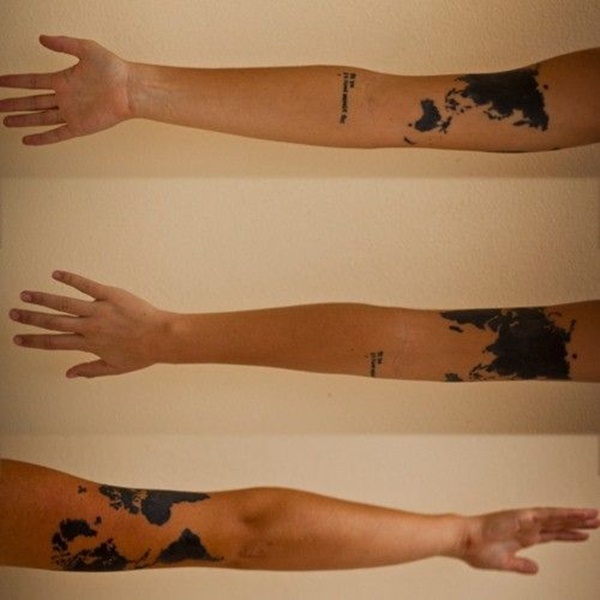 A note about these kinds of tattoos- any part of your body that will rub repeatedly against clothing with fade tattoos much faster than otherwise. 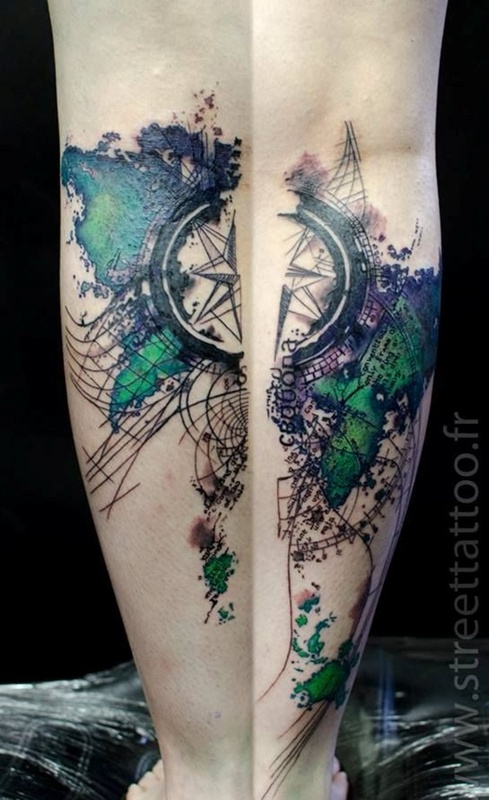 This old-world map with green continents is rich in style and well done. 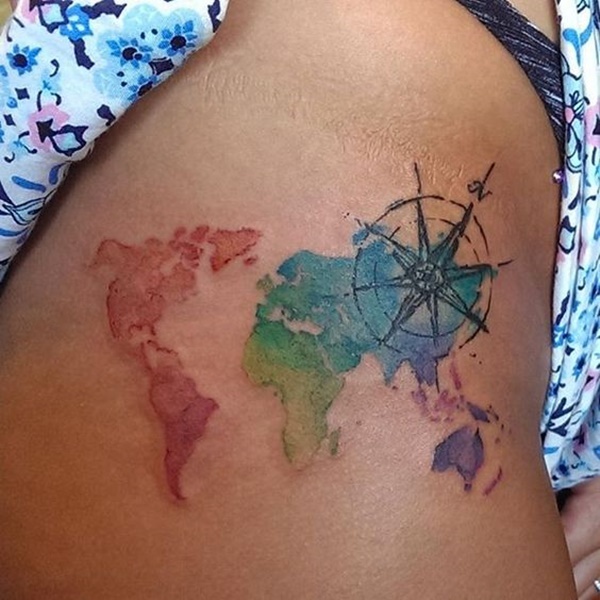 The compass rests split between both legs. 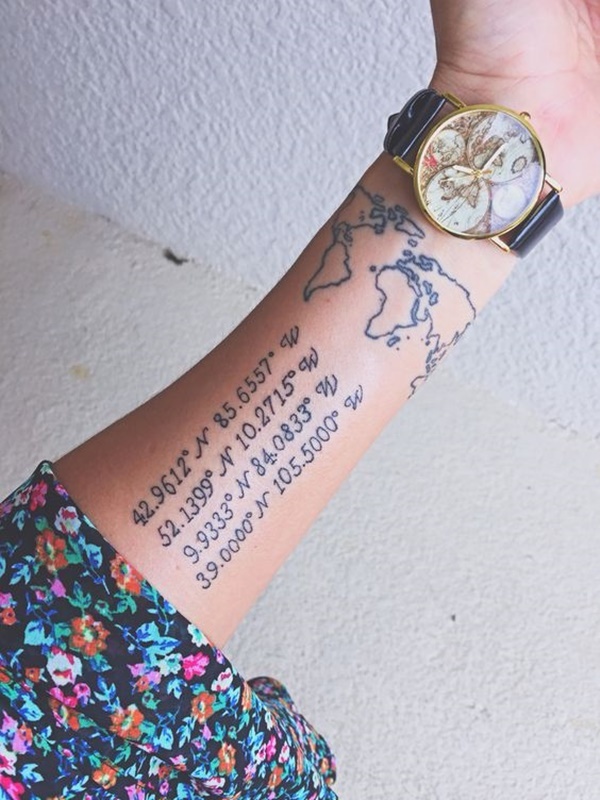 Simple geographic rendition and set of longitudinal and latitudinal coordinates sit clearly on this forearm. Out of curiosity I looked up the first- Grand Rapids, MI. 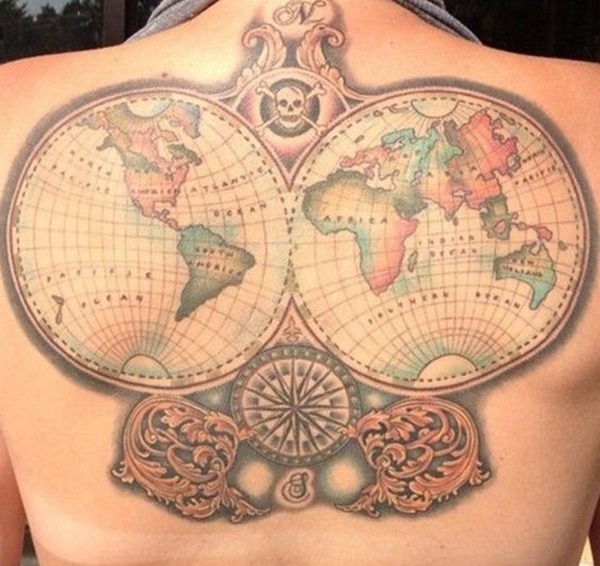 This back piece, absolutely packed with detail is an interesting reference to antique styles of maps- surrounded by various symbols and icons, these maps were as much of a work of art as the were items of utility. 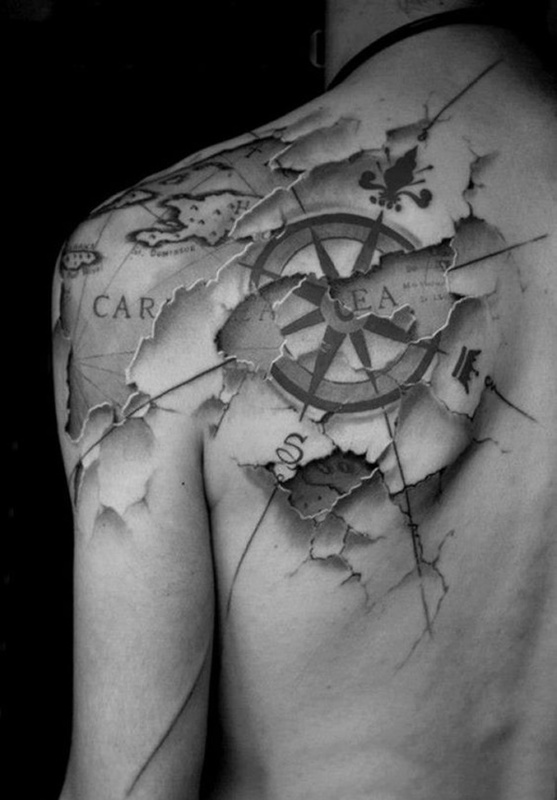 This sailing inspired tattoo centers on Europe and northern Africa. This small, all-black simple geographic rendition is actually on the moon. This attractive split globe has soft coloring and a detailed filigree. With a jolly roger sitting prominently at the top of the piece, this looks like it could have been the property of a wealthy pirate. 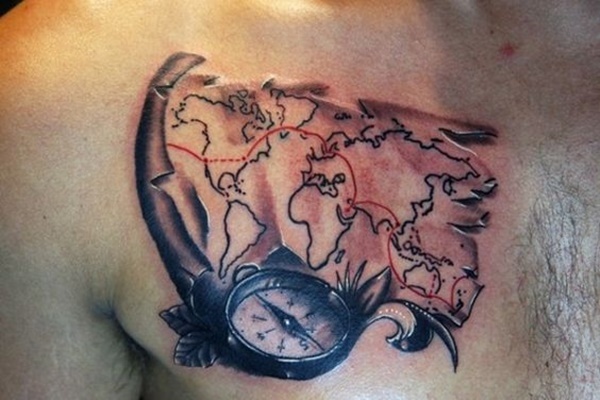 Simple geographic rendition rests on the right shoulder this time. 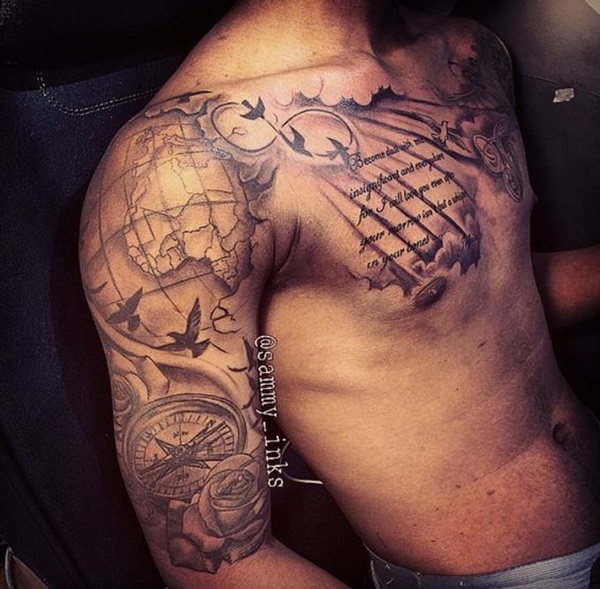 Another compass centric piece, this detailed design sits high on the back. 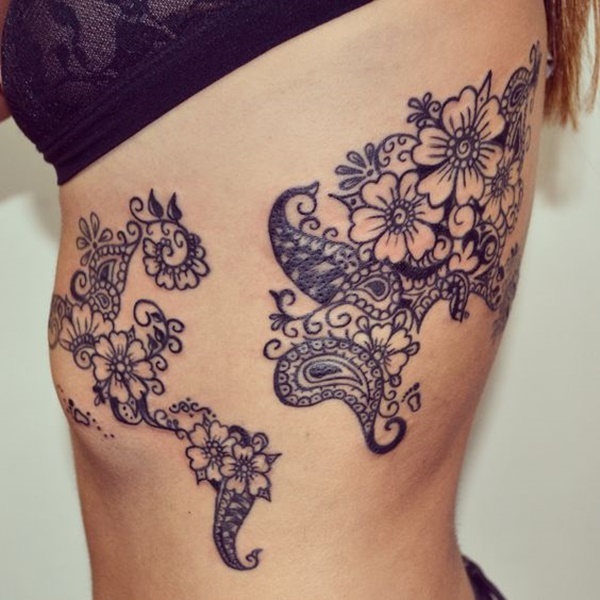 A variation on the mandala/paisley design above, this smaller version is on the rib cage. 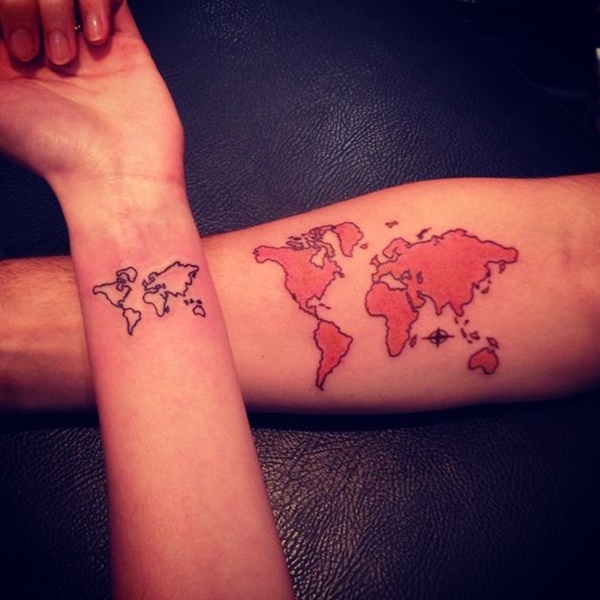 Simple geographic rendition, and its close cousin sit side by side on these arms. 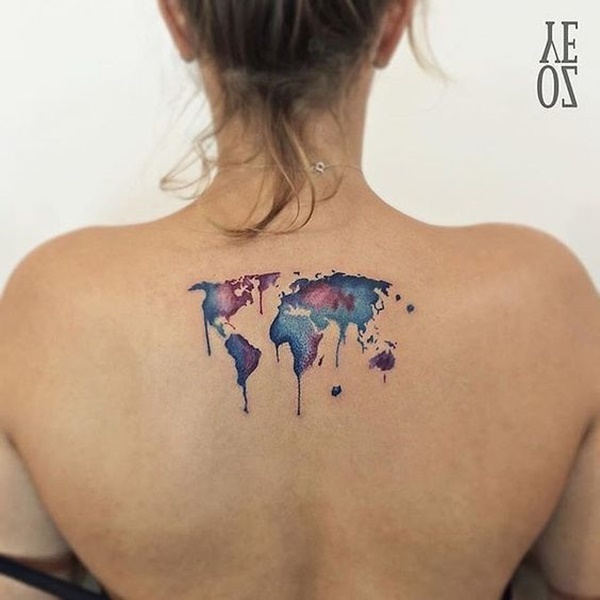 Purple and blue are the primary colors in this dripping piece on the upper back. 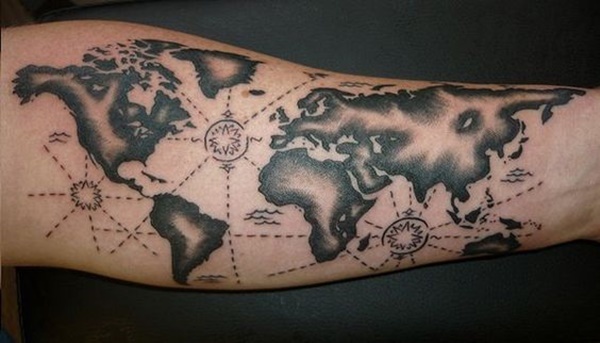 A fuzzy and stylized split globe are done in all black on this forearm. 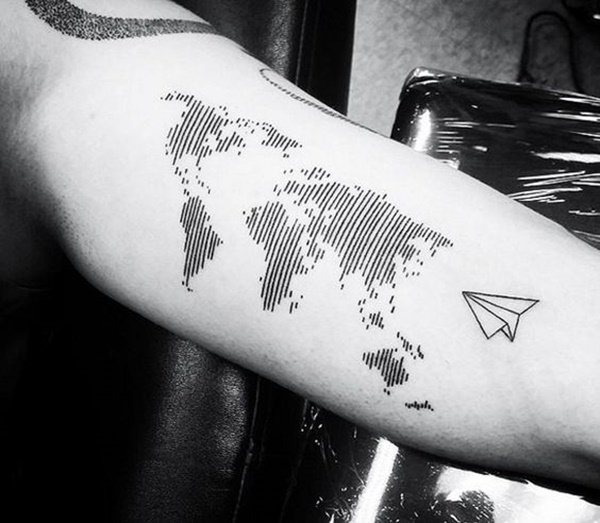 This linear silhouette is very interesting, it uses very minimalist lines to represent the world- and the flatness of this image is contrasted by the paper airplane which appears to be flying in from the foreground. A delicate take on the life of a jet setter, perhaps? 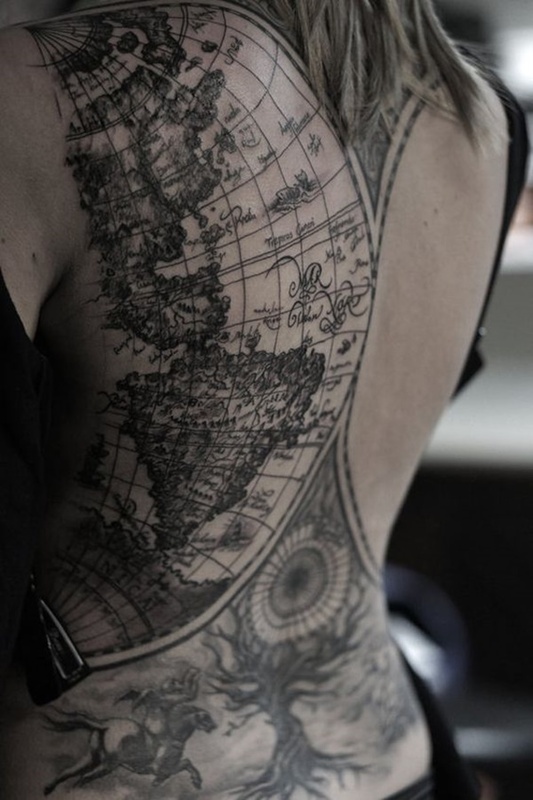 All black simple geographic rendition makes an appearance on the nape. 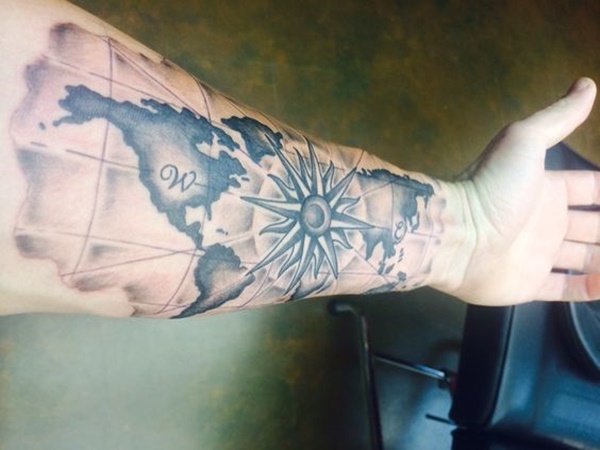 Simple geographic rendition shows up on the forearm here. 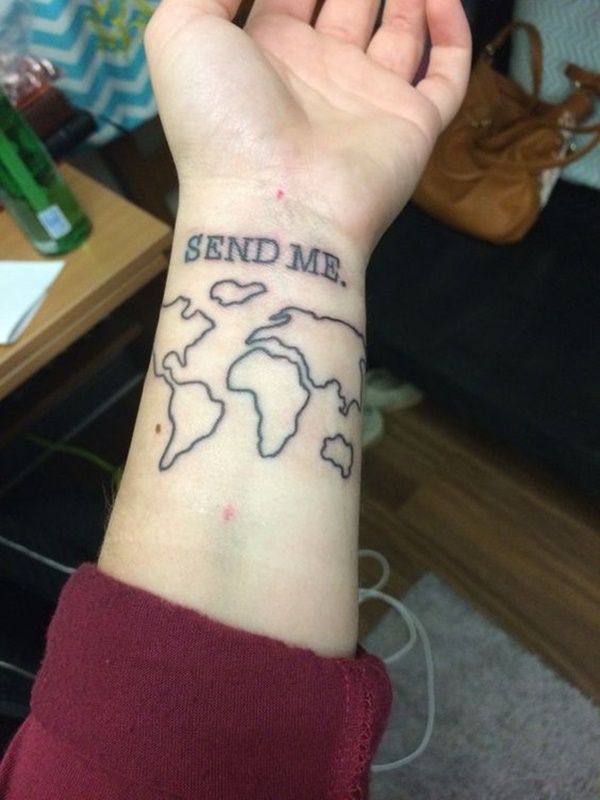 Simple geographic rendition slides over to the left shoulder, captioned with the cursive wanderlust. 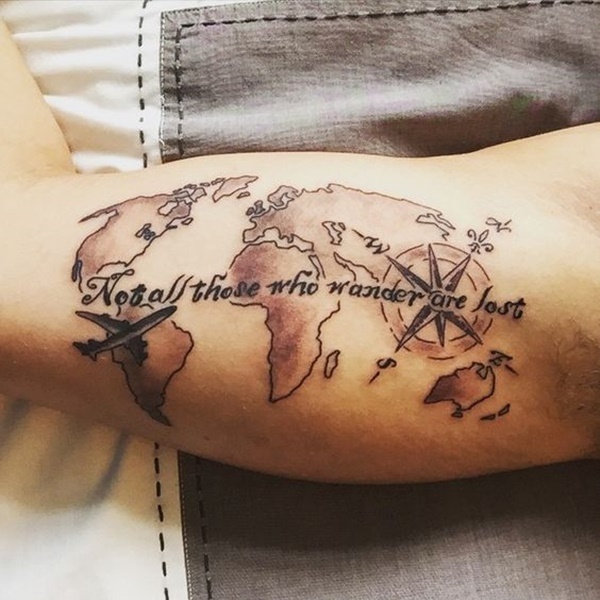 This famous quote gets redone on the inside of a map on this bicep. 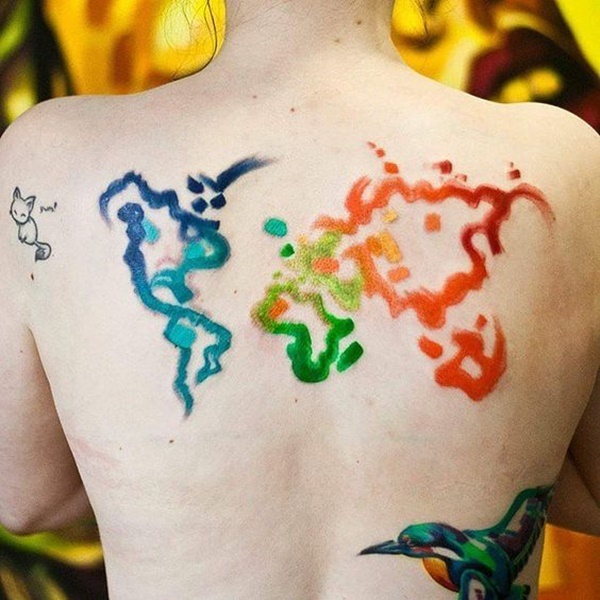 Simple geographic rendition migrates down to the outside of the hip/thigh area- a little easier for the artists to have a larger, smoother canvas. 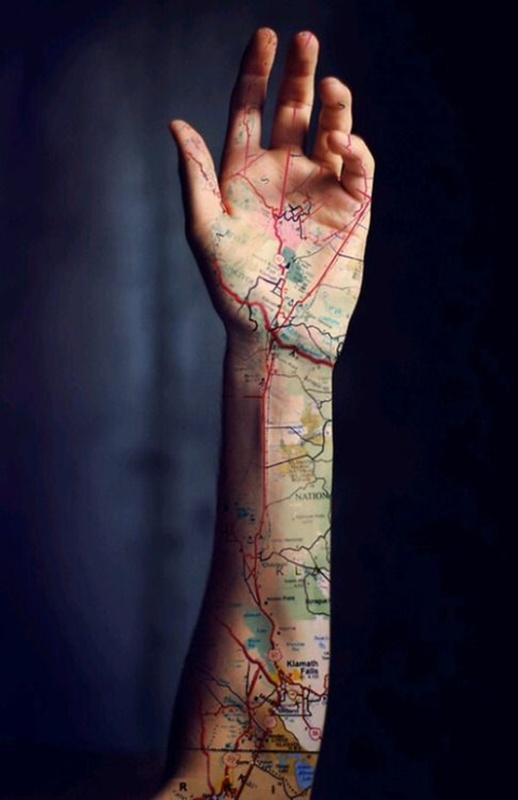 Another road map decorates the outside of this arm. 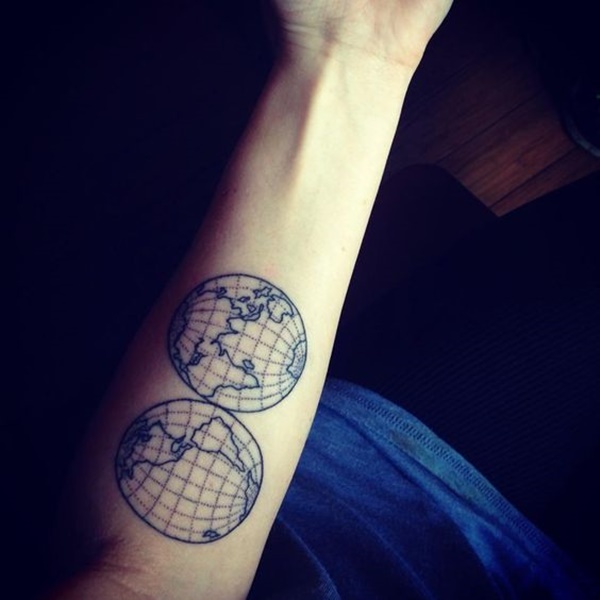 Simple geographic rendition returns on the left forearm this time. Lightly shaded black and white icons indicate a strong influence from south america. The decorated skull with a rose in the mouth is a nice touch. This paisley iteration is quite lovely to look at. 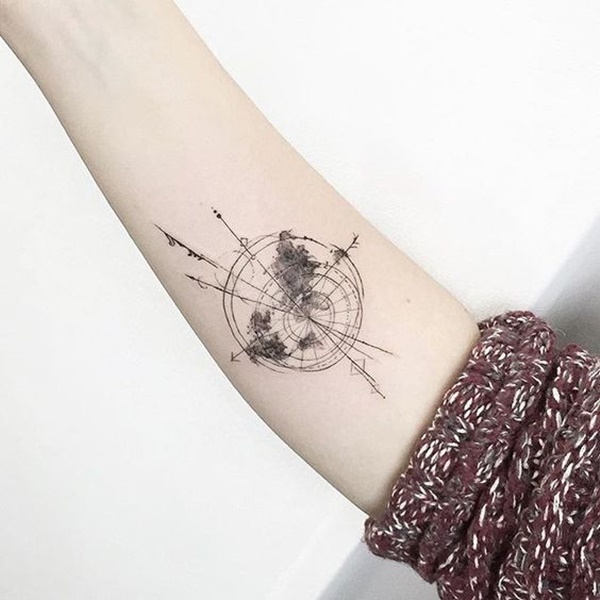 Soft watercolor map emblazoned with a stark black and white compass. This one must have really tickled. If you are planning to get a tattoo on your feet, or any other part of your body that clothing is going to rub frequently against, you should be prepared for it to fade much faster than normal. 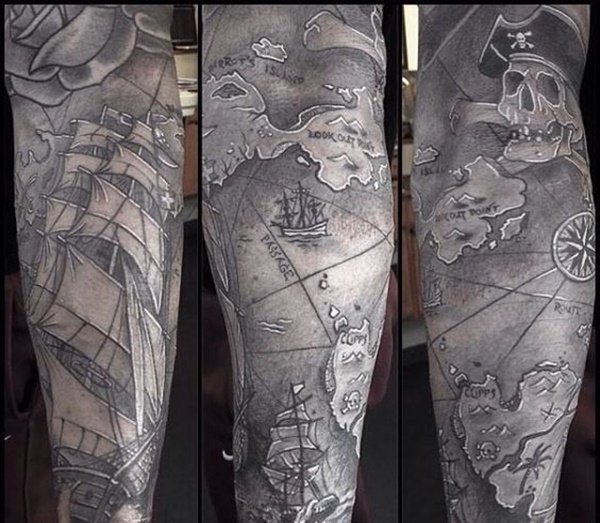 This sleeve is evocative of the age of piracy, with its’ maps, three-masted ships, rose and the classic jolly roger. This piece is sure to catch some eyes with its’ sharp highlighting and clear texture. 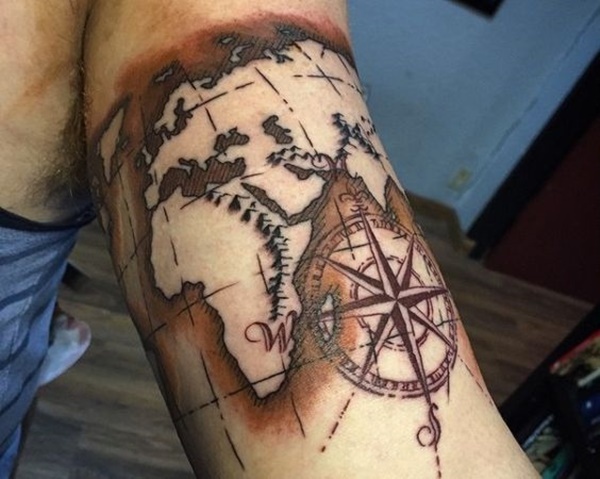 the image of the compass is in sharp contrast to the soft edges of the map underneath. 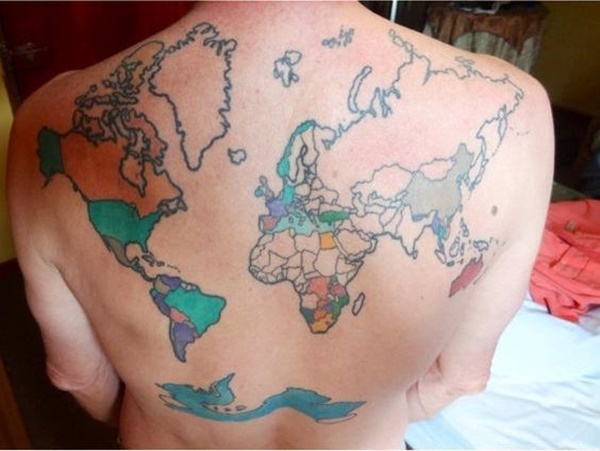 The bodily equivalent of the popular traveler’s map. 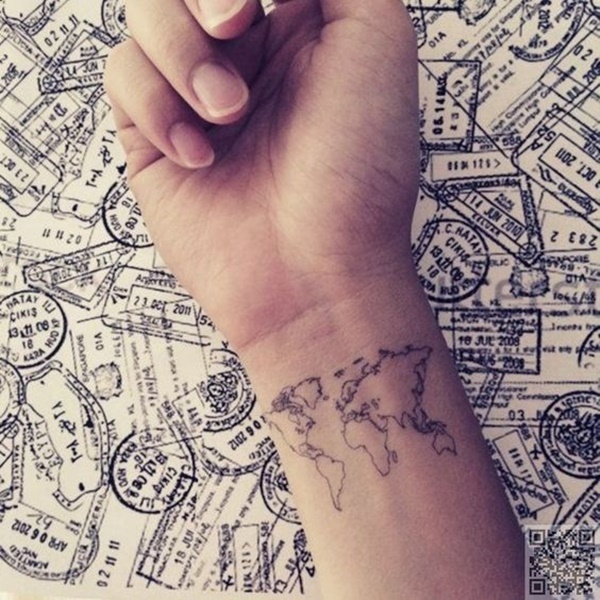 As you travel the world and see different countries, the places that you visit are gradually filled in. Note: only for the most ambitious of travelers. 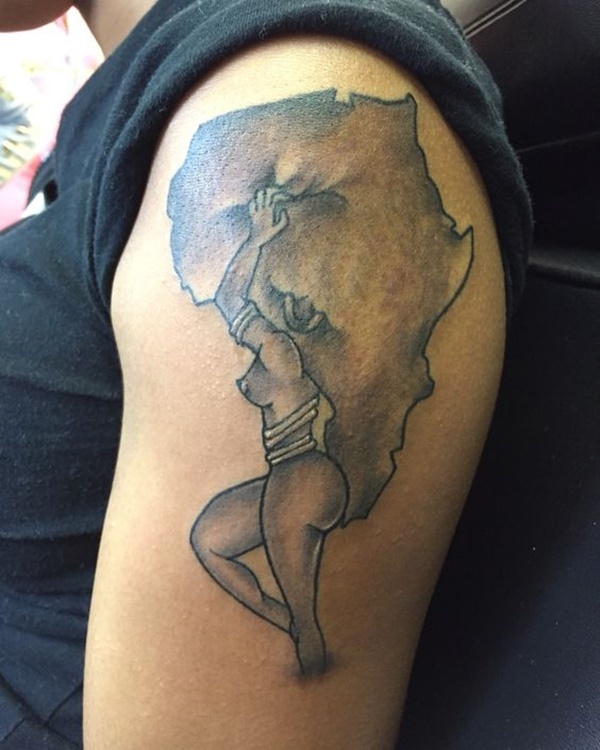 An African woman, rendered in the classic style of sailors, carries the entire continent of Africa on her back. Now that, is a symbol of strength. 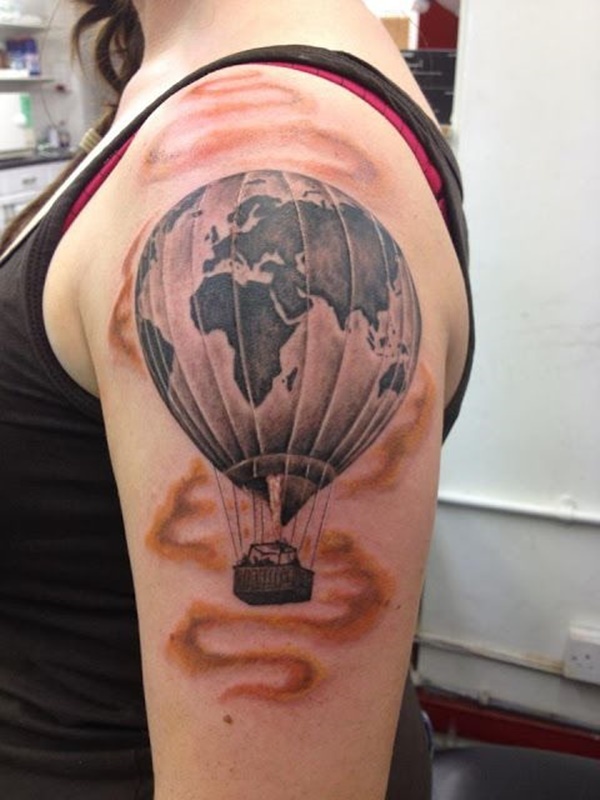 This balloon is adorned with a map of the world, and is a thought-provoking piece- considering that hot air balloons steer at the mercy of the winds, it seems an appropriate tattoo for the wanderlust afflicted. 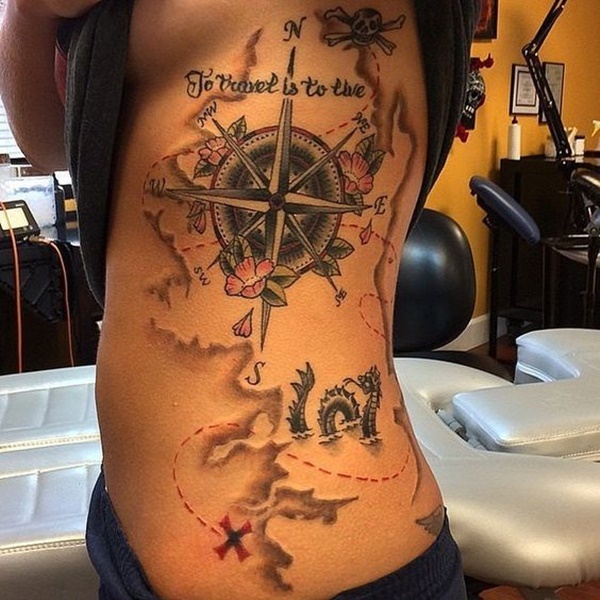 “To travel is to live,” this large side piece has all of the traditional symbols used to decorate a map, and well done at that. Small, crisp and colorful, this small version is quite nice. A blend of styles (not necessarily tied to their country of origin) fill in this rendition. This tattered piece of parchment shows a specific route for traveling across the world. Did the recipient actually take this path? 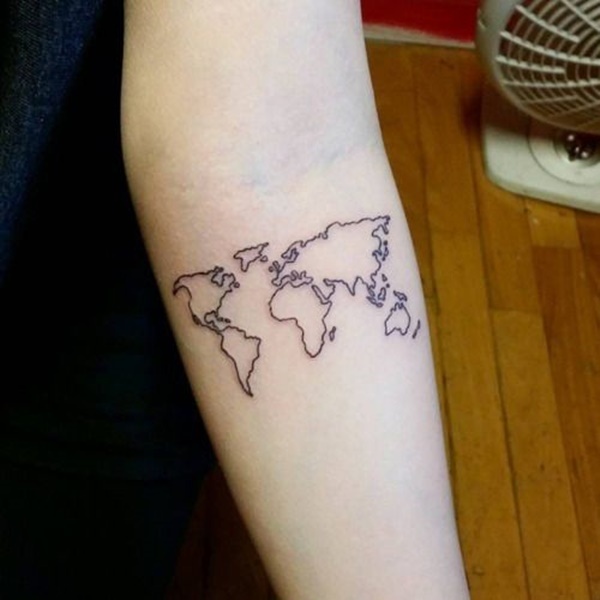 Simple geographic rendition on the bicep. A deconstructed version of the simple geographic rendition, this creative piece shows that you can still reduce an object to minimal shapes while retaining its’ meaning. 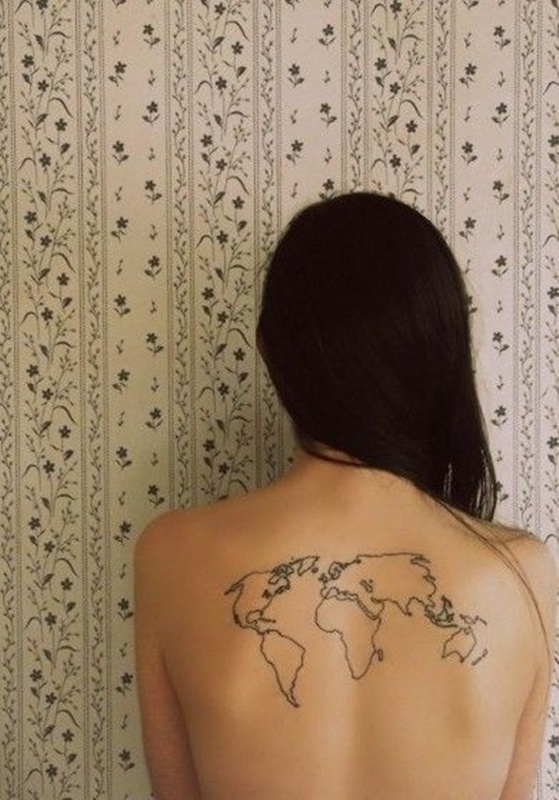 Simple geographic rendition on this fair-skinned lady. 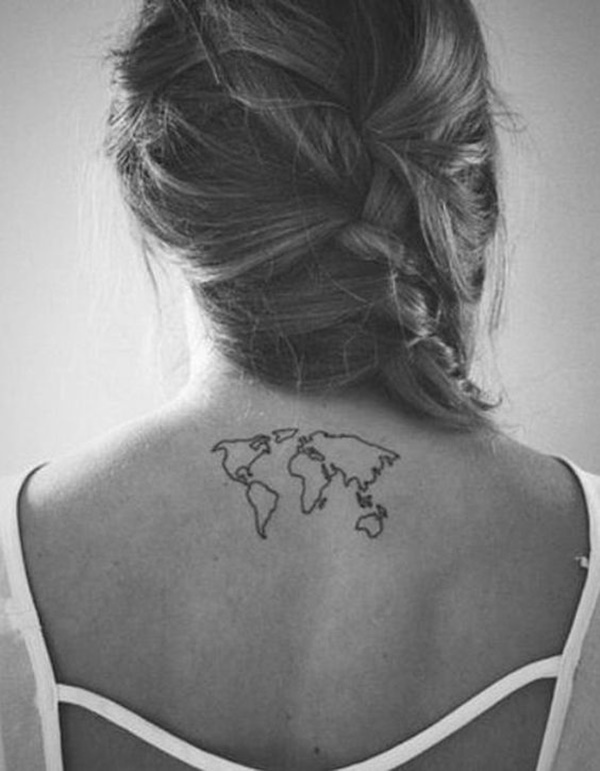 Very similar to the tattoo above, although slightly to the right and with less island detail. 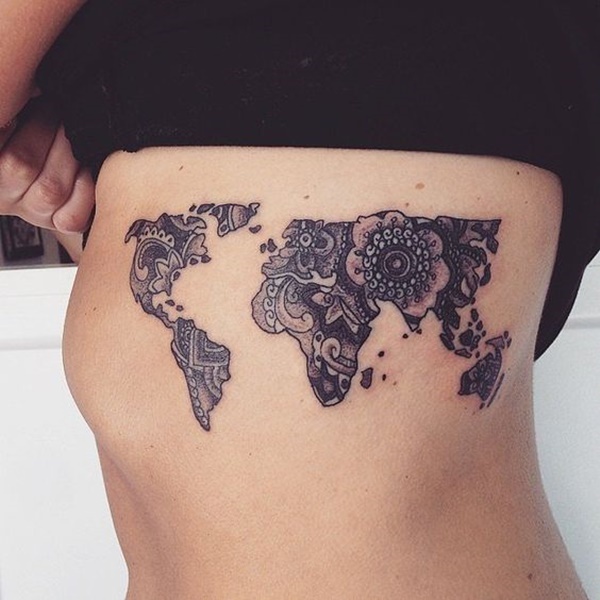 Like both preceding tattoos, but slid down lower, onto the rib cage. Simple earth icon done in crisp lines. 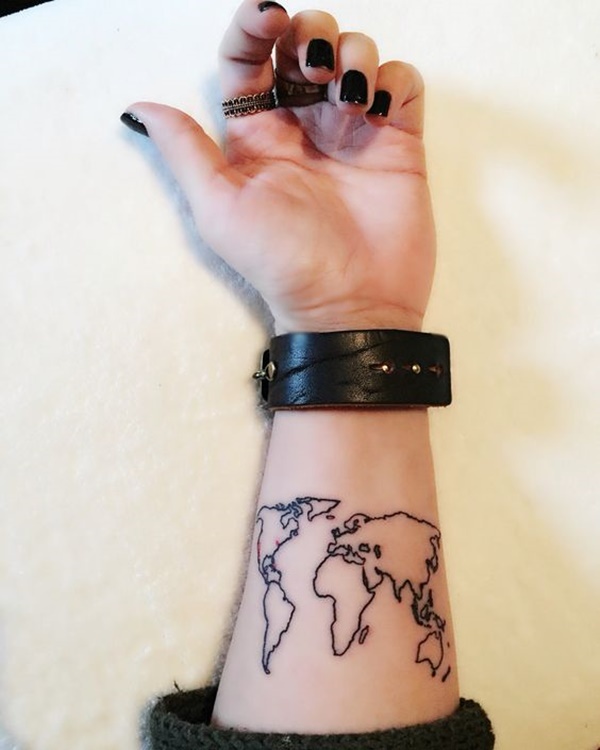 The ambitious traveler’s tattoo returns: this person seems pretty well traveled- although I am a little confused as to why they decided to fill in the Mediterranean Sea. Are they going to fill in other minor seas that they visited? 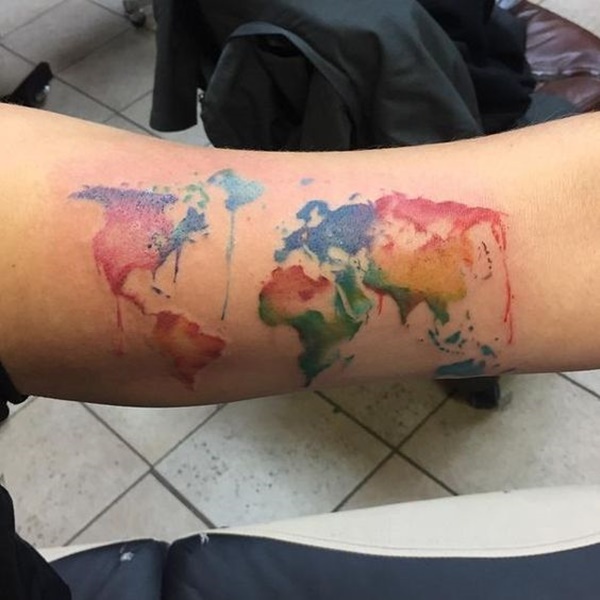 This lineless version of the map drips with color. 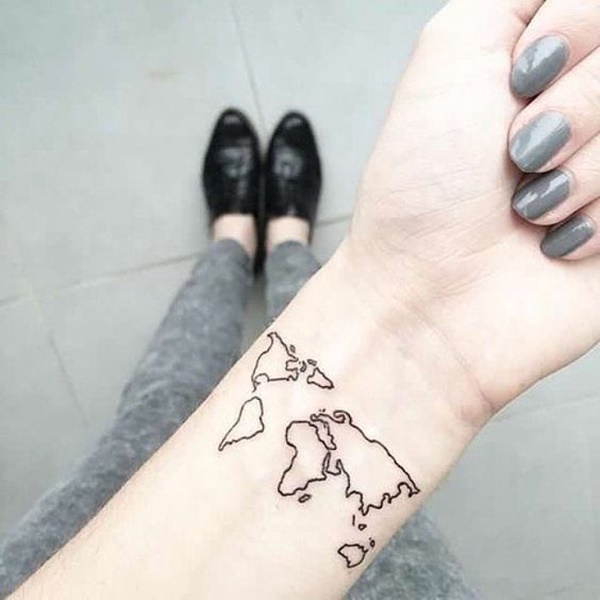 This simple geographic rendition sits on the inside of the left wrist. 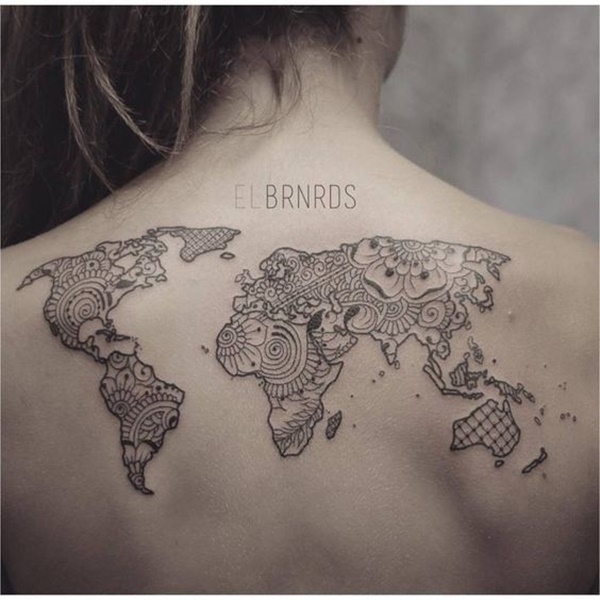 A simple geographic rendition hovers just above the right shoulder blade. 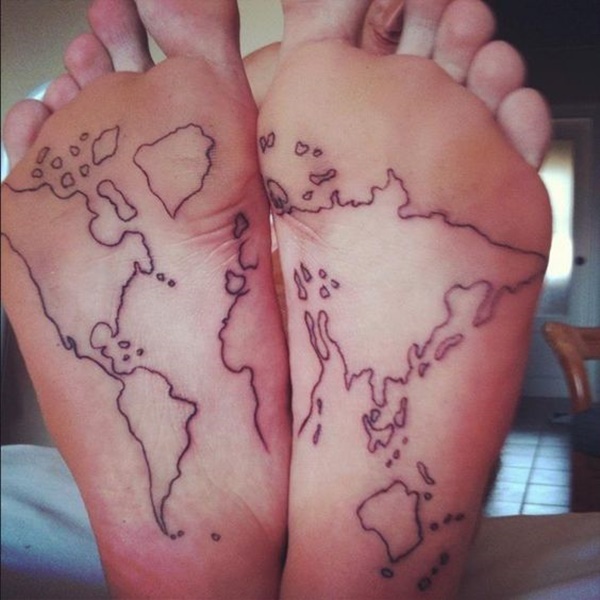 This simple geographic rendition sits split between two feet. 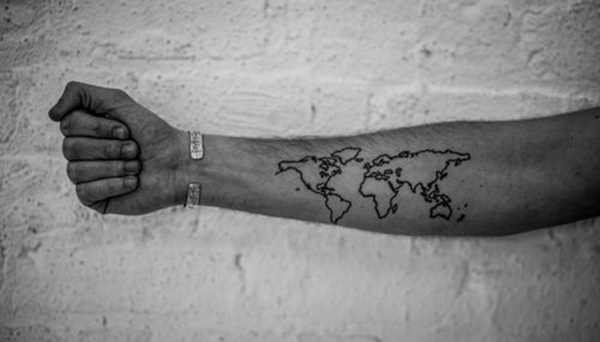 The simple geographic returns again to the inside of the left wrist. 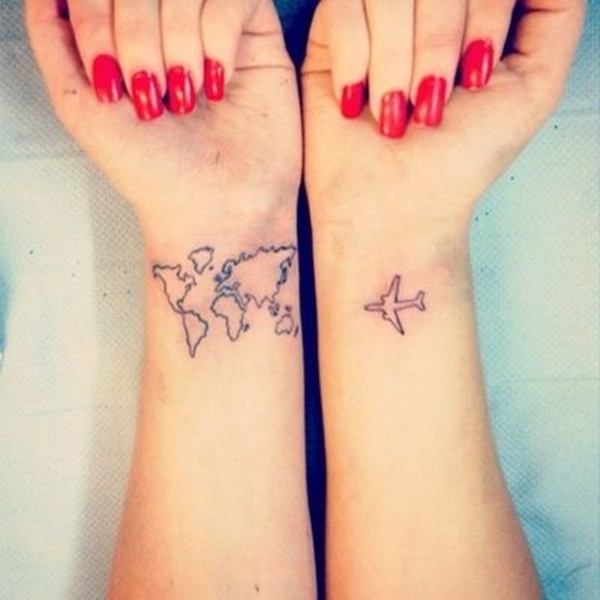 The simple geographic rendition on the inside of the left wrist, but this time, with a cute plane joining on the right wrist! The preferred method of travel perhaps. Another rich shoulder piece crafted with care. 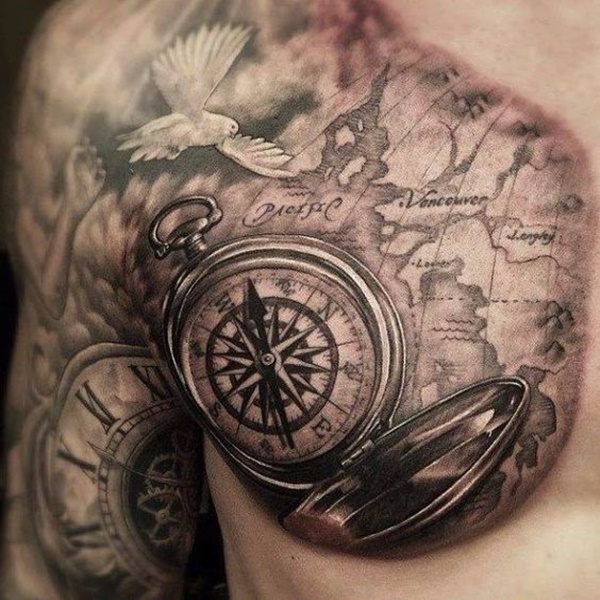 The level of detail in the compass, watch and dove say that this tattoo took time. 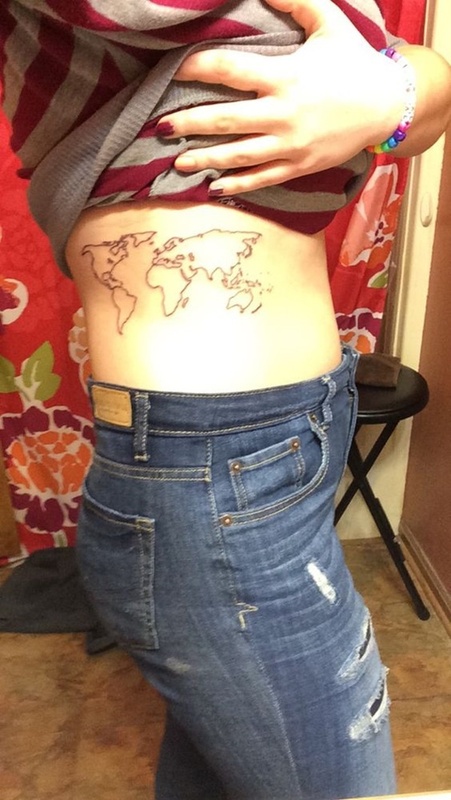 Considering the location of the map, I wonder if they hail from the Pacific Northwest. This map has is edges faded with soft black and white pointillism. 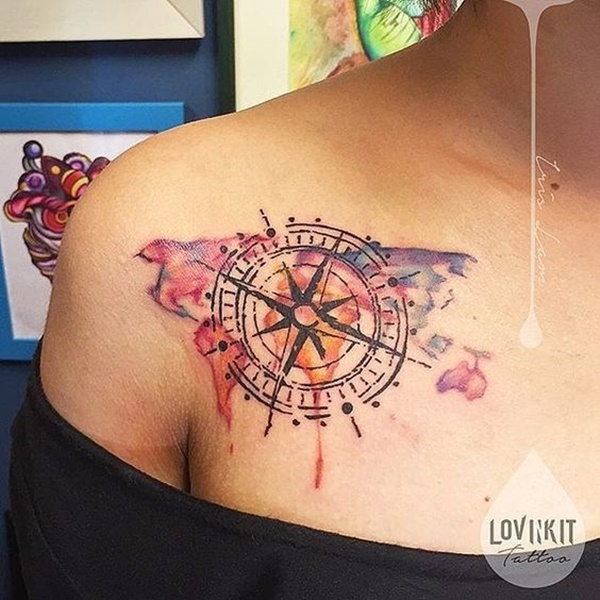 Layered nicely with a compass directly between the shoulder blades, this is a pleasant piece. 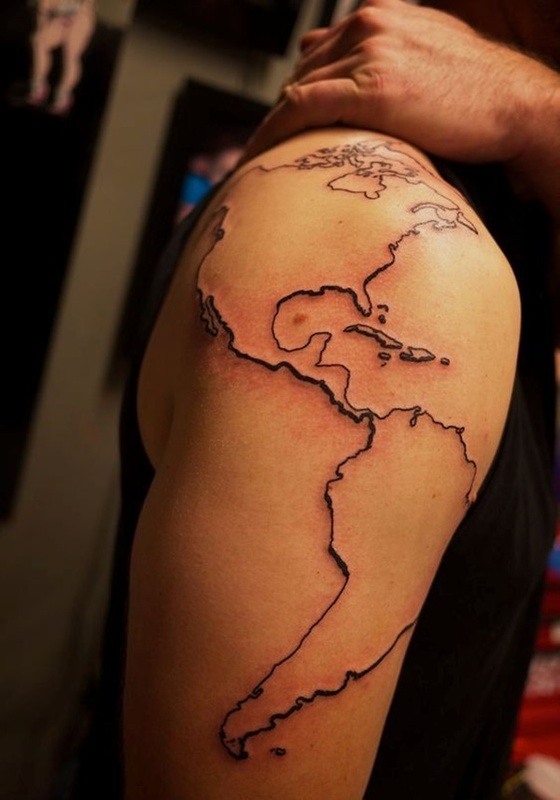 Slight thickening of lines give this a raised edge- North and South America look quite nice wrapped around a shoulder. 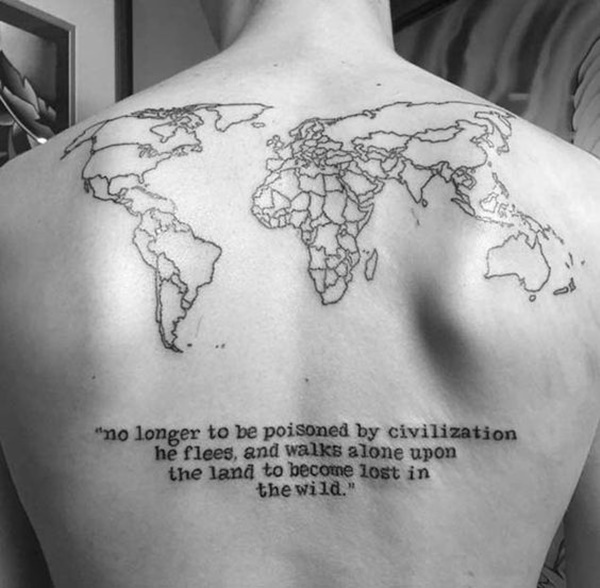 With a quote taken directly from the Supertramp himself, Christopher McCandless- this evokes the true nature of the lone traveler. Rooted in self-sufficiency and spiritual self-discovery, the path he chose is not for the faint of heart. It is quite respectable though- most people just try to to mitigate or divert their own disgust with civilization. Some brave and noble souls actually attempt to change it through participation, and even more rarely, like McCandless, voluntarily choose exile. Reminiscent of the PanAm logo, this sits on the inside of the left bicep. 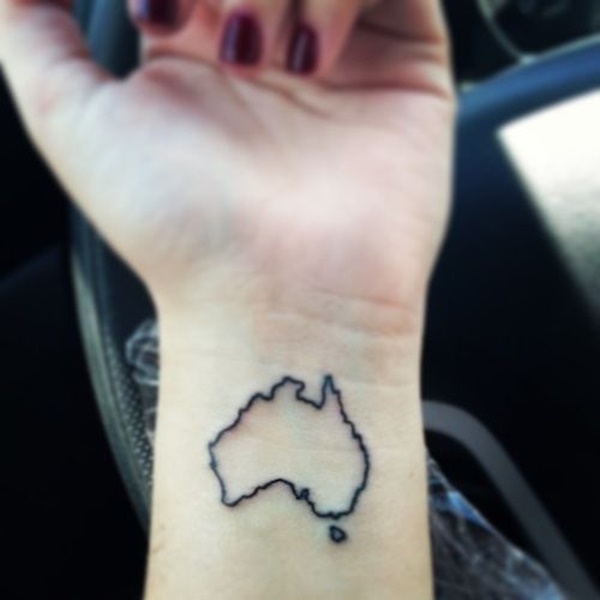 Among the simplest of geographic renditions, this has a clear and unmistakable message. 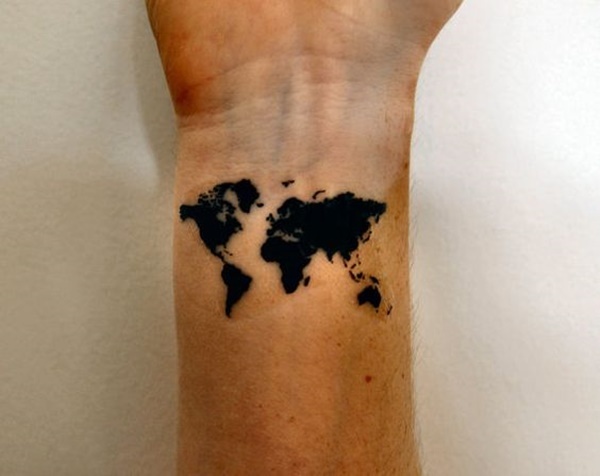 An all-black simple geographic rendition sits on the inside of the wrist. The romantic imagery of the previous days of exploration are quite popular. This piece is impressive if for no other reason than the magnifying glass. The white highlights make the icons pop right off the arm. 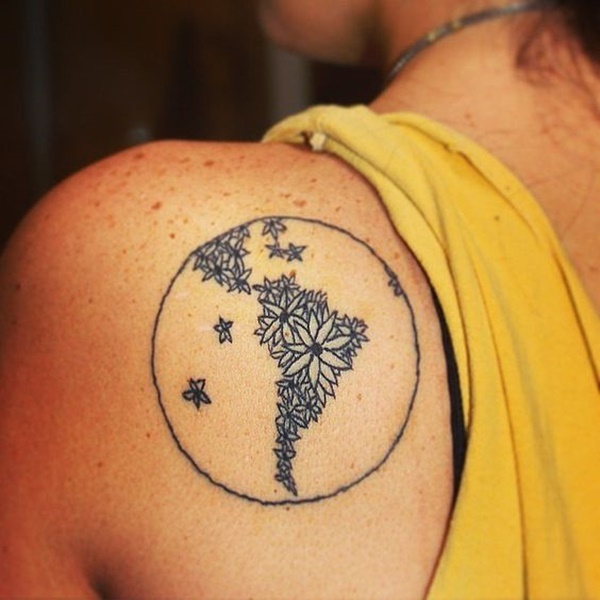 A traveler enamored with the Americas possesses this piece. I’d be curious to know what the parchment text is. This shading is reversed in this piece, with the oceans taking the brunt of the coloration. 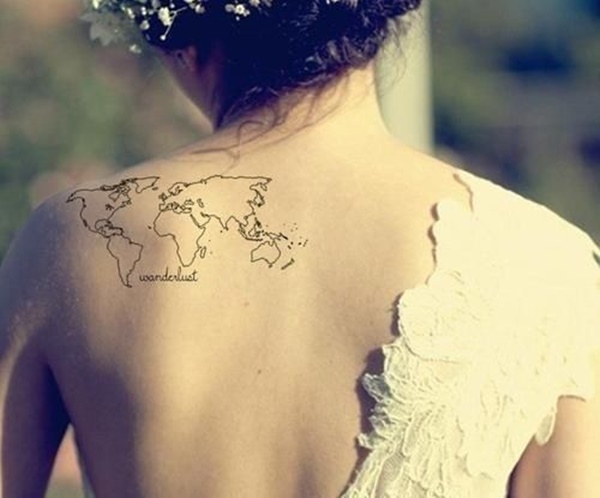 It’s a refreshing take ona familiar tattoo. 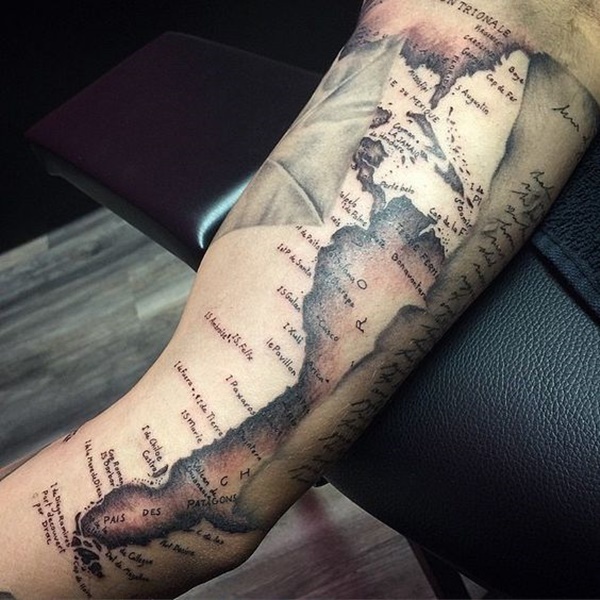 This filled-in black map wraps itself around the bicep. 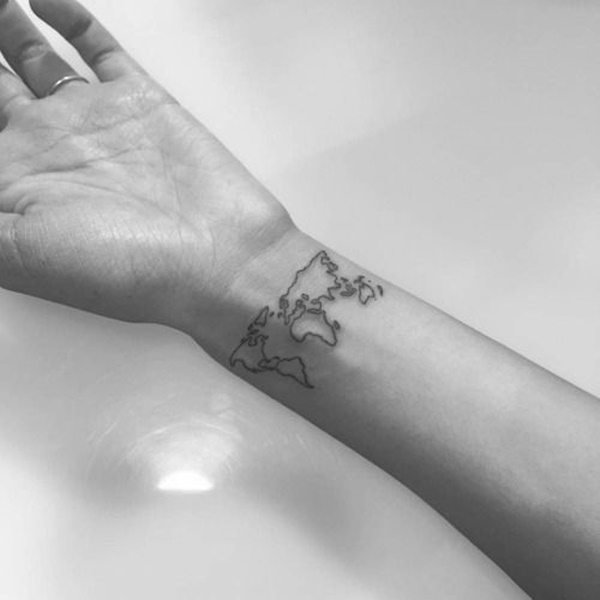 A faint simple geographic rendition returns again to the inside of the left wrist. 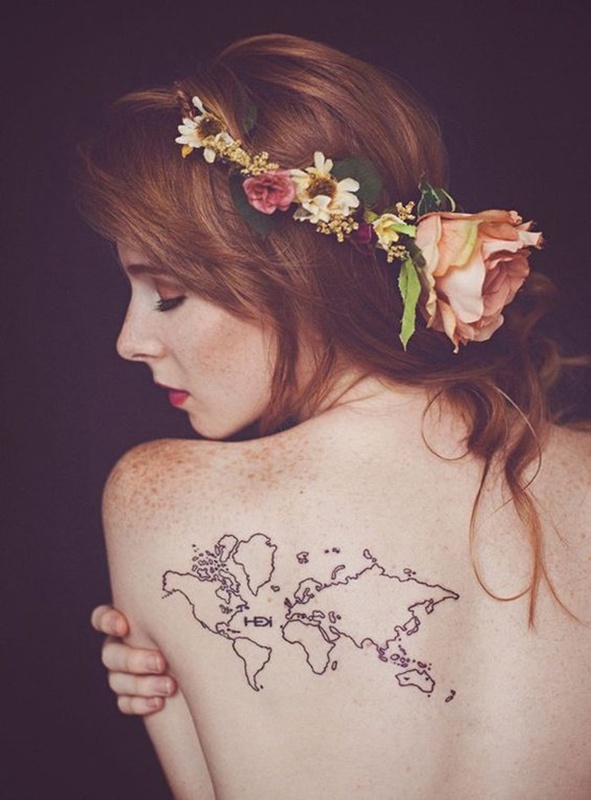 This creative globe shows the South American continent rendered entirely in flowers. This is a funa nd creative original take. 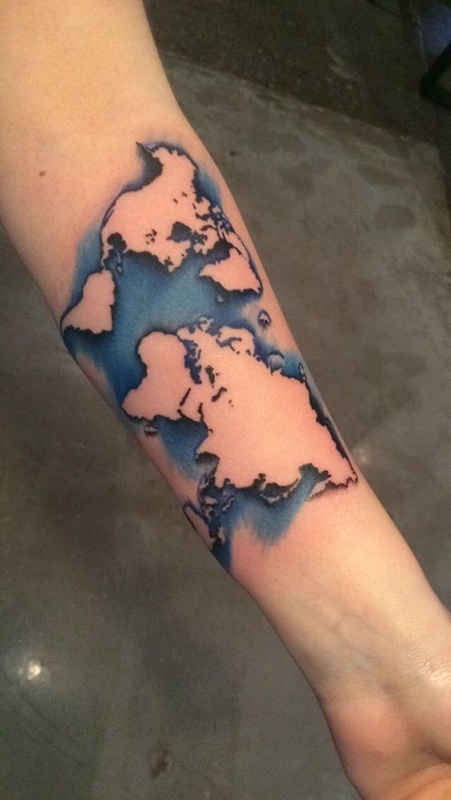 Another fresh take on the simple geographic rendition, the color of the ocean is a visually pleasing counterpoint to the outlines of the continents. 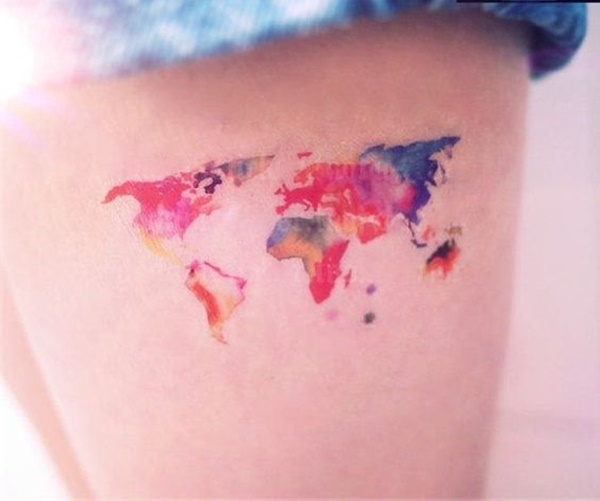 Lineless and colorful, this map sits high on a thigh. 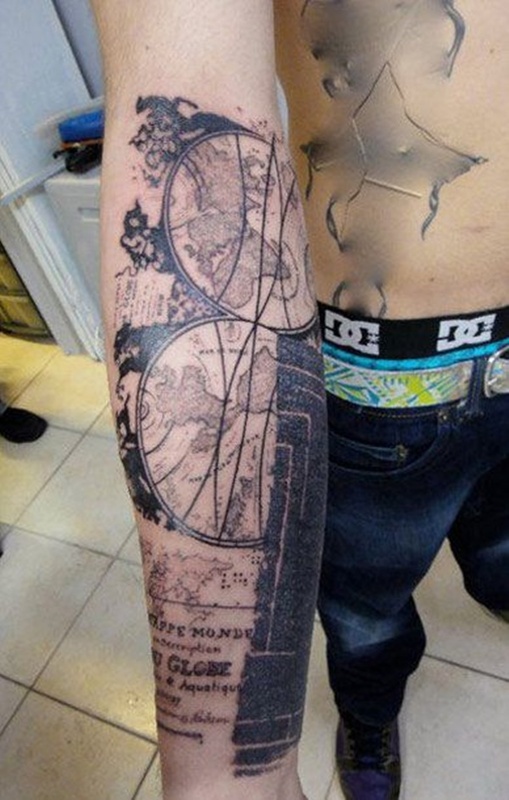 This appears to be a collage more than a single unified piece- it has the classic symbols of the compass and rose, birds in flight, cartography styled map, infinity symbol, and even a quote with light rays. 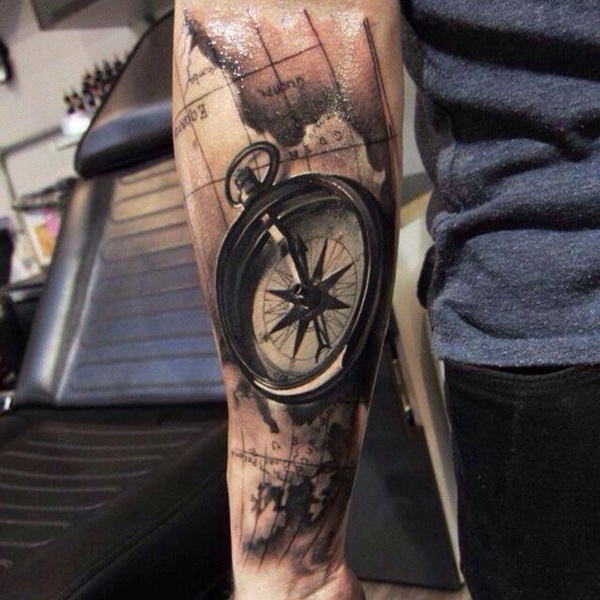 This is a great tattoo because it takes the familiar and popular design and begins to push the boundaries. A gently fading rainbow colors this piece, with thickly rendered brush strokes evoke a completely different medium of paint. The symbols are clear and unmistakable, and well executed. 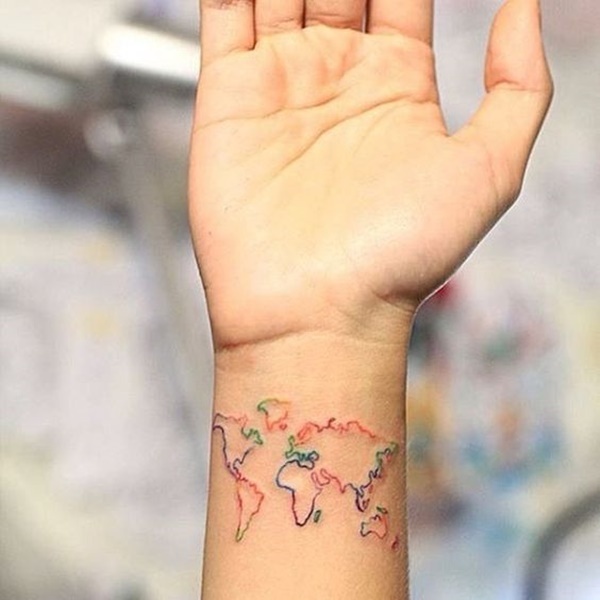 The left wrist wears this small colorful simple geographic rendition. 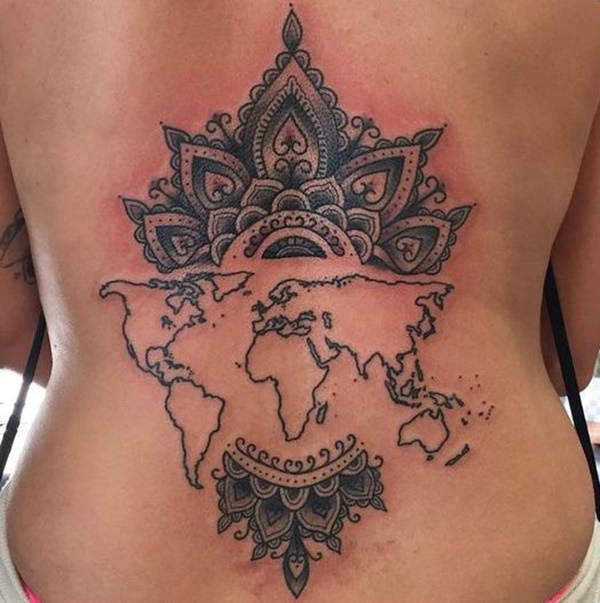 A lotus mandala frames this simple geographic rendition, bringing a tasteful and decorative quality to a familiar piece. 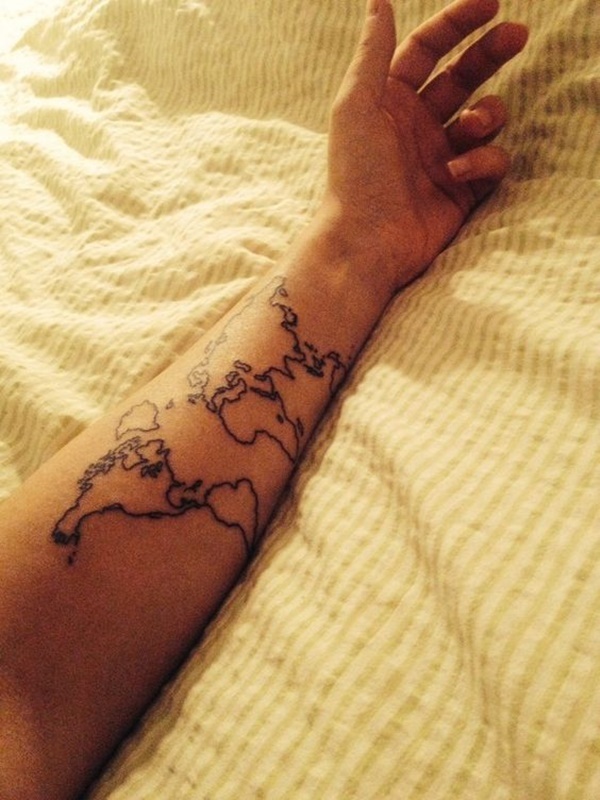 The world map wraps itself around a bicep in this faded piece. 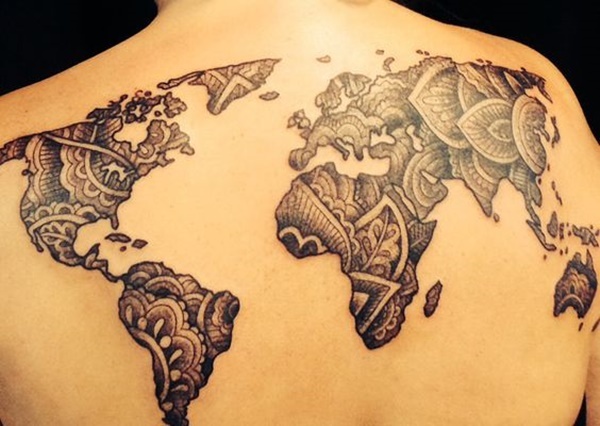 Simple geographic rendition is filled in again with the influence of mandala-like designs. 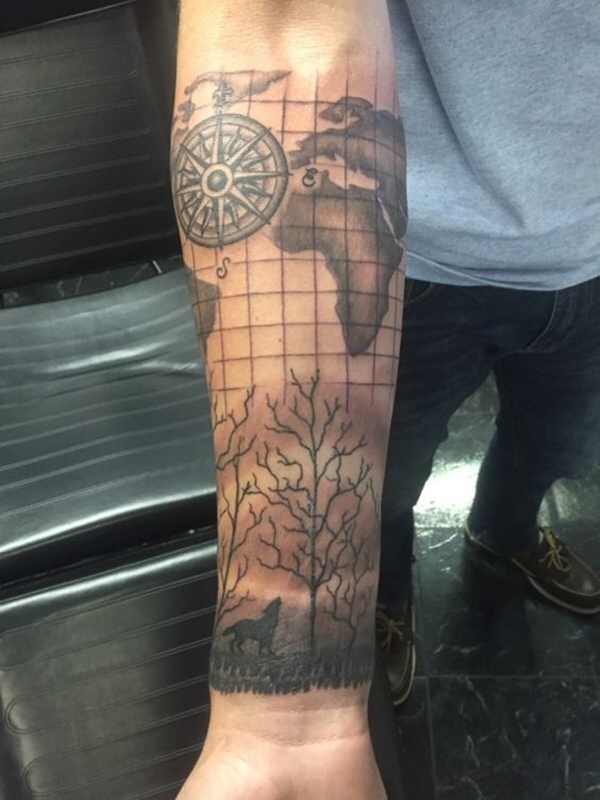 The cartography inspired map sits above a wolf howling around some dead trees. The simple geographic rendition in its’ natural state, in its’ natural habitat. Perhaps a quick reference for the number of continents in the world- although most leave out the polar regions.